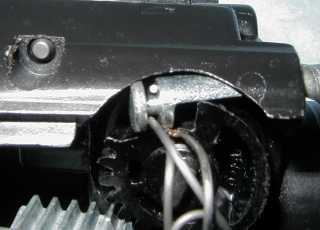 Lock plate, turn signal switch (5 screws), and key switch (puts in). 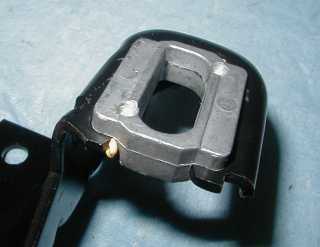 1 bolt hold the lock. I have a question... Is it possible to change the steering wheel to the disconnects config... Like the racers... and for theft reasons. I've seen the attachments but I don't know if they fit our cars... Has anyone tried this before? Thanks for the writeup. 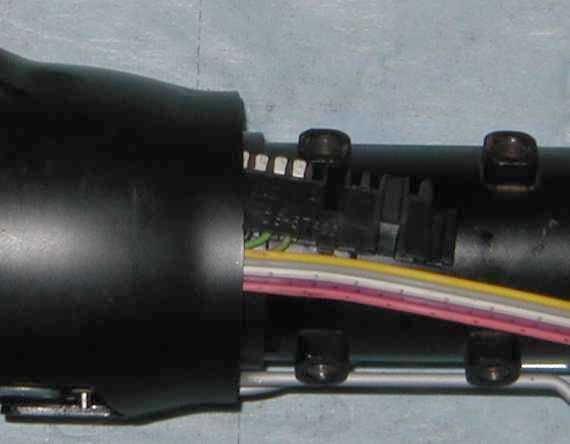 im 14 and i was able to repar my wobbly steering column! You mean having the steering wheel you can pull off like on stock cars? You have a good point. Having no steering wheel in the car while its parked would make a great antitheft device. I have a question myself. 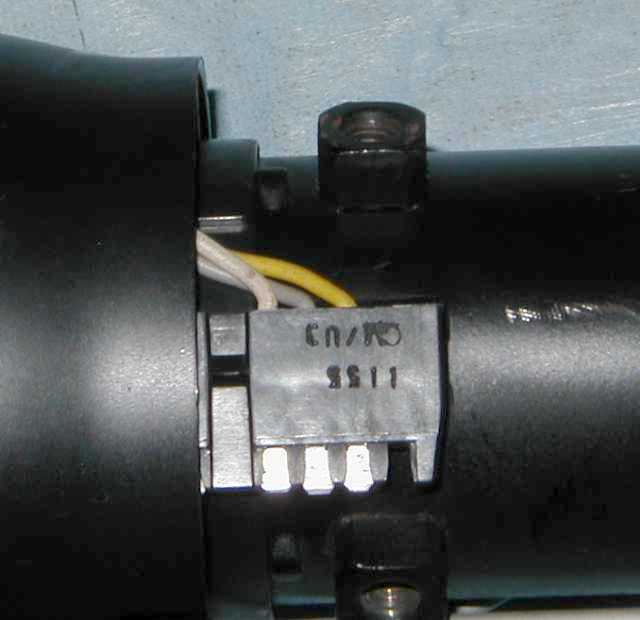 I cant seem to find a cancelling cam. 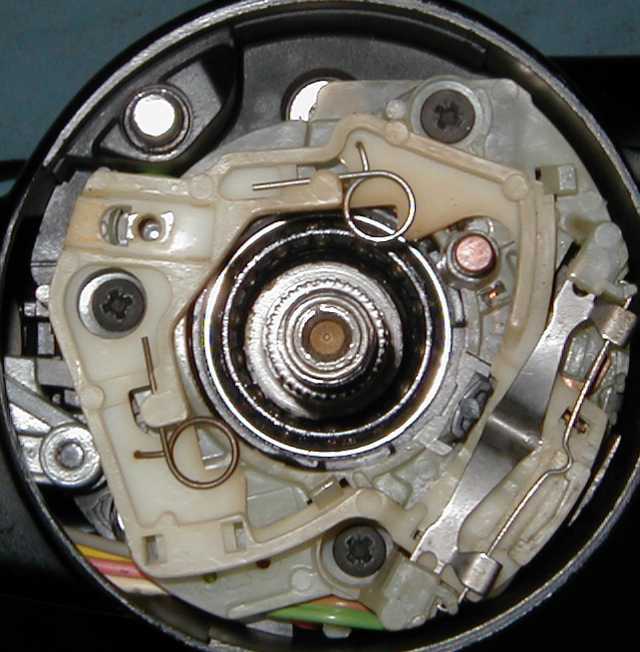 The part where the horn spring loaded thingy goes in was broken when I got the car. There are no fieros in my area on death row(wrecking yard) plus I think a cancel cam shouldn't be something you have to get from a boneyard. 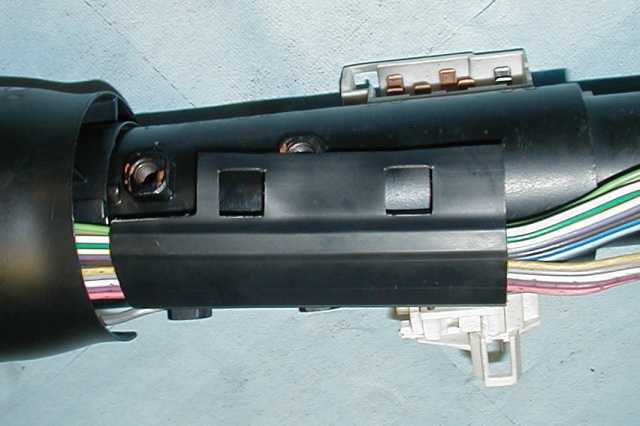 I mean, they fail almost as much as the turn signal switch, which they DO have at my local parts stores, so where do I get a cancel cam? 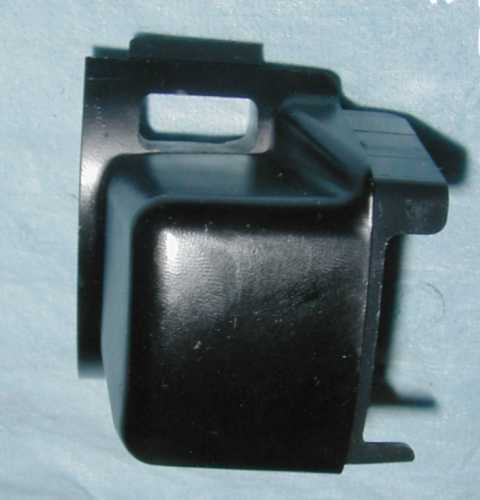 And why doesn't the turn signal switch just have a cancel cam come with it? 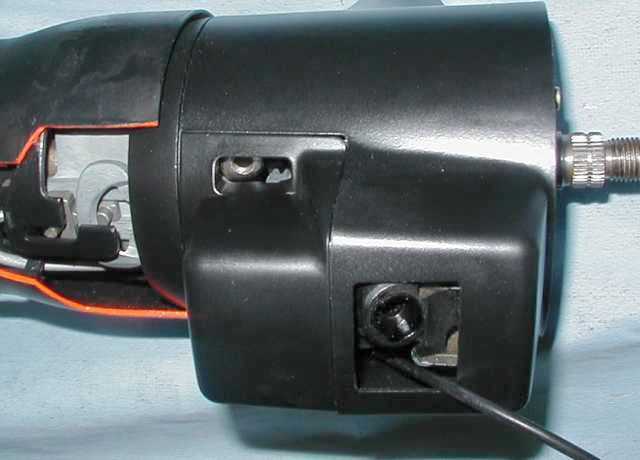 I would be willing to pay an extra 5-10 bucks on every turn signal switch I buy for the rest of my life just to have the cancel cam be there so when I need it, its there. Seems like every second or third one I replace also needs a cancel cam. 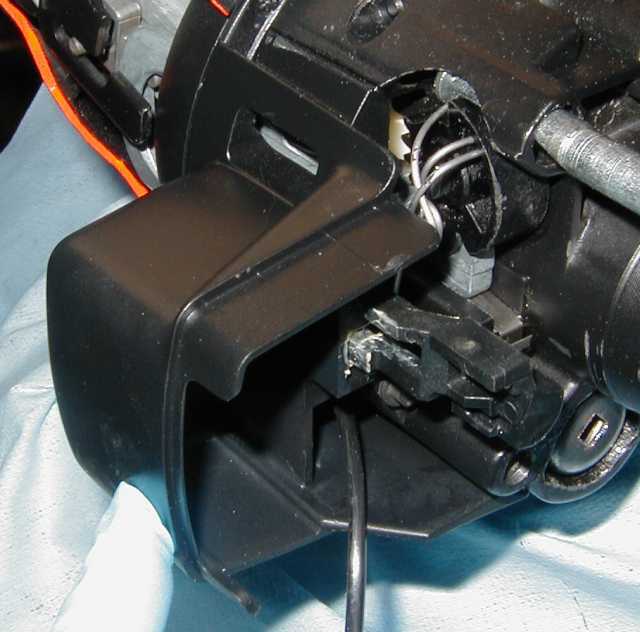 Maybe there's another GM car with a cancel cam that fits? 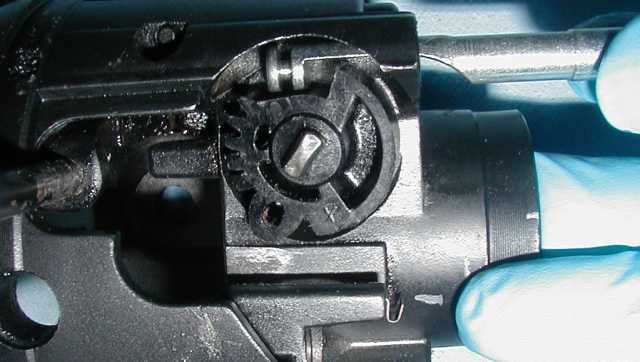 I haven't had this car long, but with all the hassles I'd almost swear there was some kind of conspiracy going on in the parts industry against fiero owners. 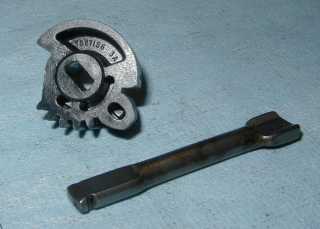 i was unable to get the two pivot pins out. the first one came out easily - the second had the threads stripped as i tried to pull it out. 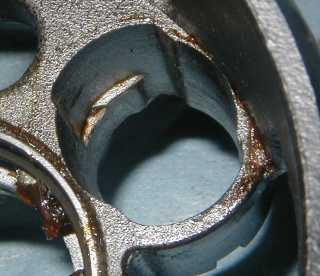 i tried to drill out the threads and tap in larger threads but the drillbit broke off as i worked. 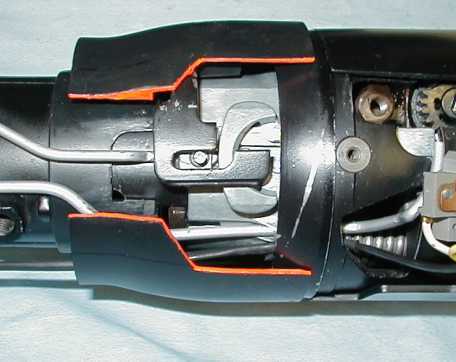 now i have to get another steering column. so much for the convenience of options on cars. 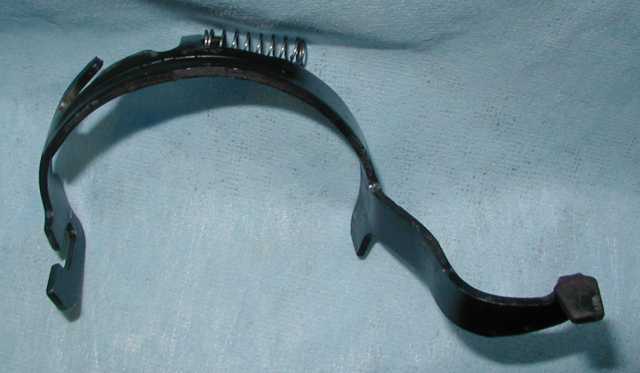 i was unable to get the two pivot pins out. an update, i was able to get the two pivot pins out by pulling the column, and using a 9/16 socket with a #8x32 screw, a nut and a couple of washers to pull the pin out. 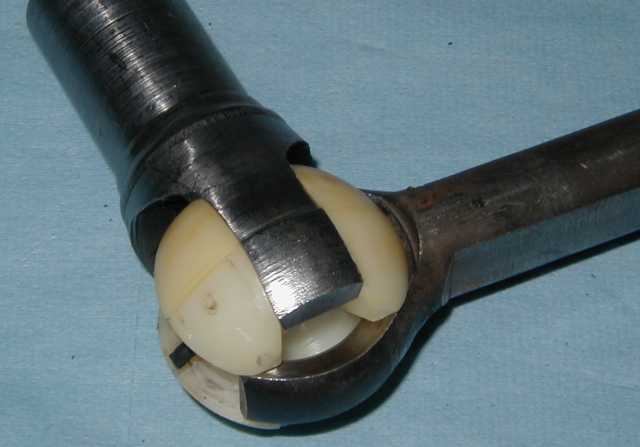 i have then been able to dig into the column and access the four offending bolts. 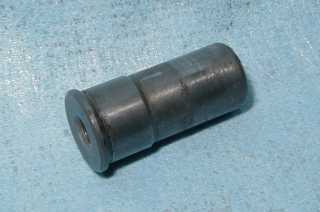 i have red locktited them and torked them as best as i could using a 1/4" 6 point socket. i hope i found all the ball bearings. edit: i successfully completed the repair and i drove my car yesterday - wow! what a difference! if i can do this, you probably can too! thank you God for Jazzman and his great writeup! thanks Jazzman! I read through Jazzman's tutorial and it is very good but I have a question. 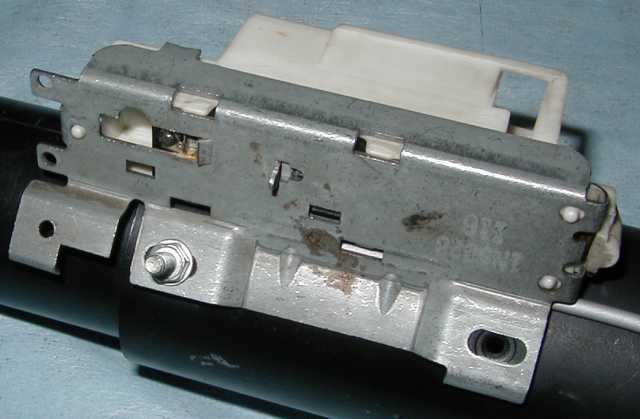 I want to remove the ignition switch, locking mechanism and key removal lever. Can I do this without affecting the turn signal, high beam and wiper functions? I understand Jazzman has left the site but hopefully someone else can shed some light. Glad you are still here. A remote key is exactly what I want to do. Thanks for the help, I'll let you know how it works. 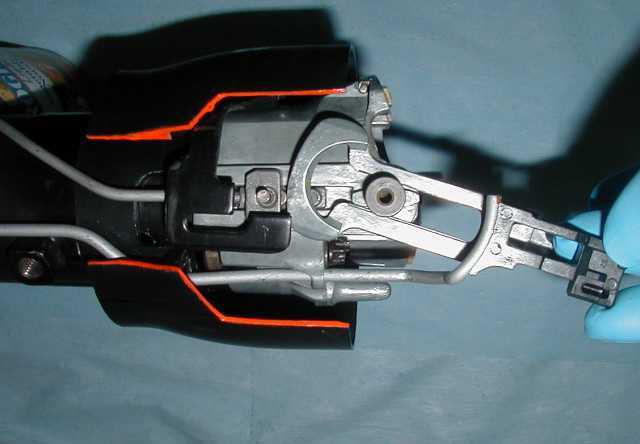 I haven't been able to find the post that is just to fix the wobbly steering wheel. Would you be able to reply with a link to it or something please? Thanks! It sounds like you want a remote key system? 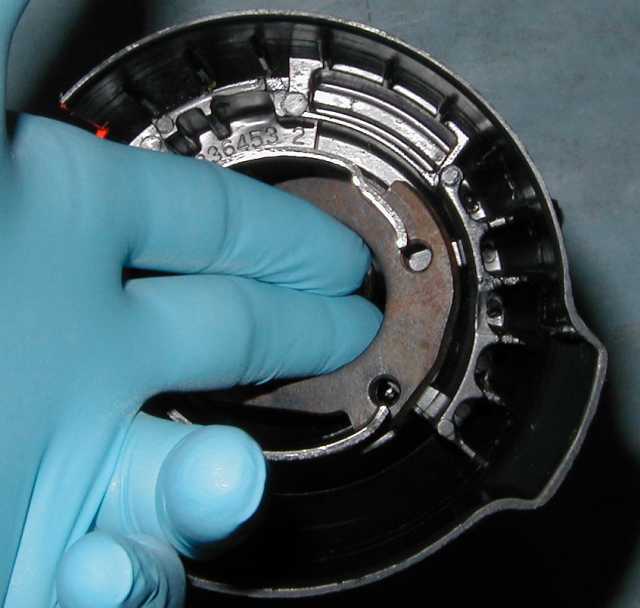 If so, sure, you can remove the ignition switch, lock cylinder, and lock pin w/ spring, but you must keep the lock plate as it is part of the assembly stack and holds the horn cancel cam and plastic trim cover in place properly. 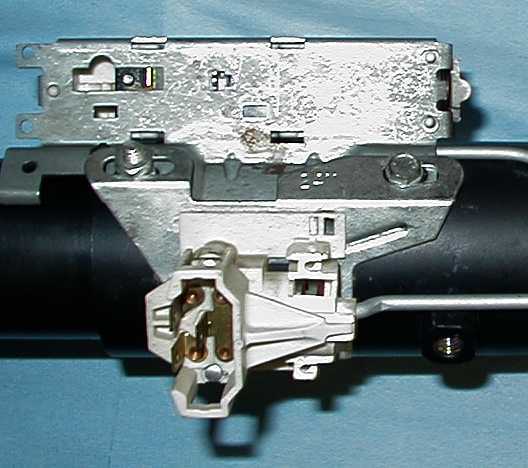 You'll need to retain the ignition sector since it guides the high beam follower. 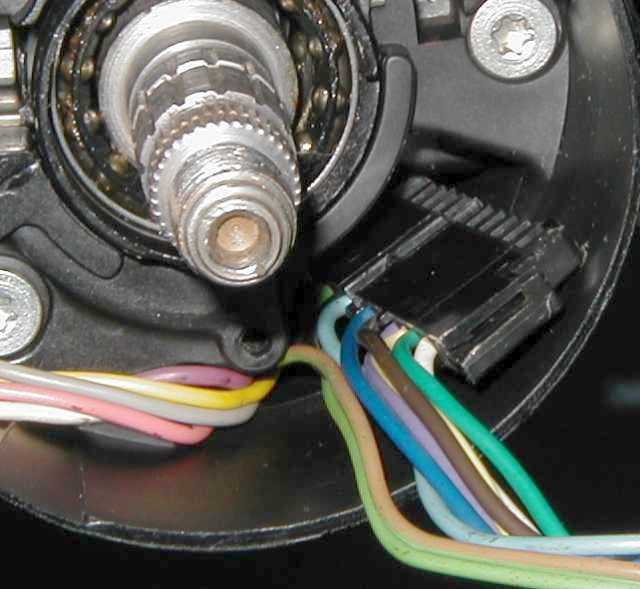 You should be able to get away with bolting just the high-beam switch on the column without the ignition switch, though it may be necessary to put some spacer washers under the switch to replace the missing ignition switch assembly. You could try posting a message on the MALL section of this forum. Just a bump - I had a wobbly steering column on my Formula - my son has been driving it and made a comment the other day that the steering wheel was wobbly. Last night he said it was really bad so I took a look - he was right. It had several inches of movement - every direction. I followed this thread in reverse to tear it down to the bolts (I used a few shortcuts - did not disconnect any wires - just pulled the slack through the column and was able to pull each piece off and let them hang). All four were completely backed out! I was able to tear it down and put it back together using this thread - ran into a little snag when it was time to remove the pivot pins. 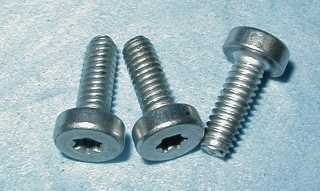 I attempted to use a machine screw and "wiggle" each out - was afraid that I would snap the screw off. 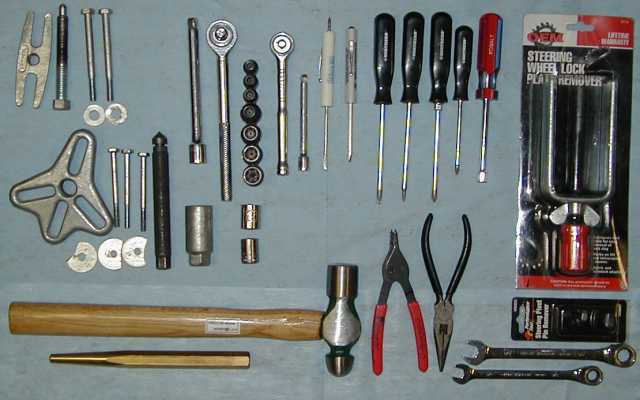 I posted here in tech and started the internet for a tool. Ended up getting a puller at O'Riellys - worked perfect. Thanks Jazz for your hard work in this thread! 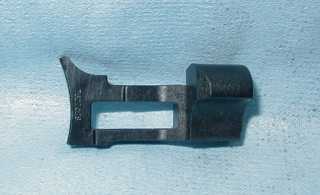 Thought I'd post a couple of current links for the pivot pin puller tool. Picked up a column to replace mine with stripped holes for the infamous 4 loose bolts. Found that the replacement columns main shaft was 1 inch shorter than the one I just took out of my car. So I had to disassemble two columns to make one good one. So there are at least two different length main shafts out there. bump for a great thread! 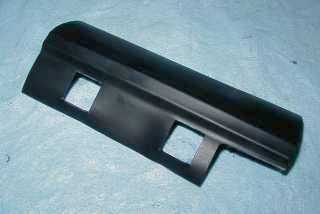 i just had to take apart the column on my gt to tighten loose bolts and this made it a whole lot easier. Thanks for the great tech how-to but I haven't been able to see any of the photos. All I have are broken links. Is there somewhere to see the pics that go along with this post? 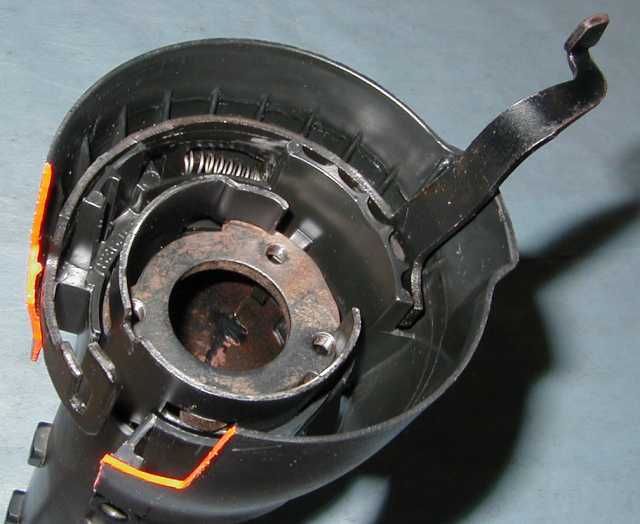 I'm asking because I just did this repair on my GM tilt column and the steering wheel still wobbles, so I'm wondering what/where I went wrong. 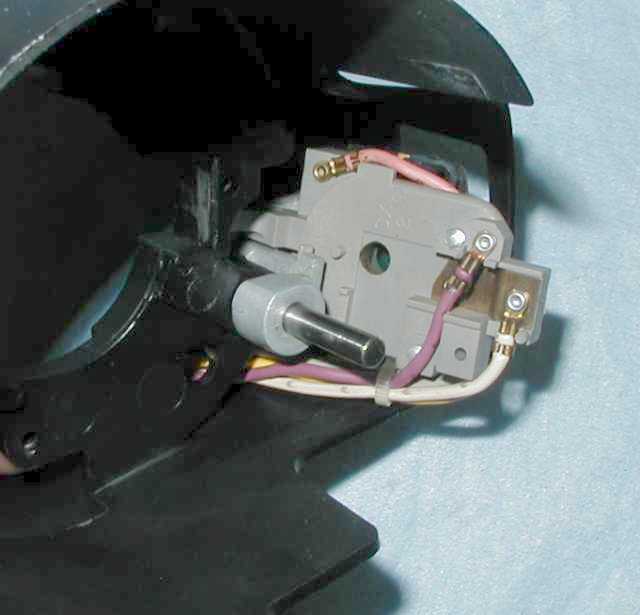 DIY_Stu posted a .pdf to Jazzman tech article with all photos intact on Pg 2 of this thread. Anyway, you can do the whole job for just $9.99 + tax. 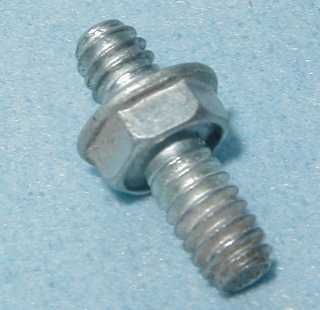 If you don't have any Loc-tite handy or are too cheap (or broke) to buy any, you can use your wife's (or girlfriend's) clear nail polish on the bolt threads. 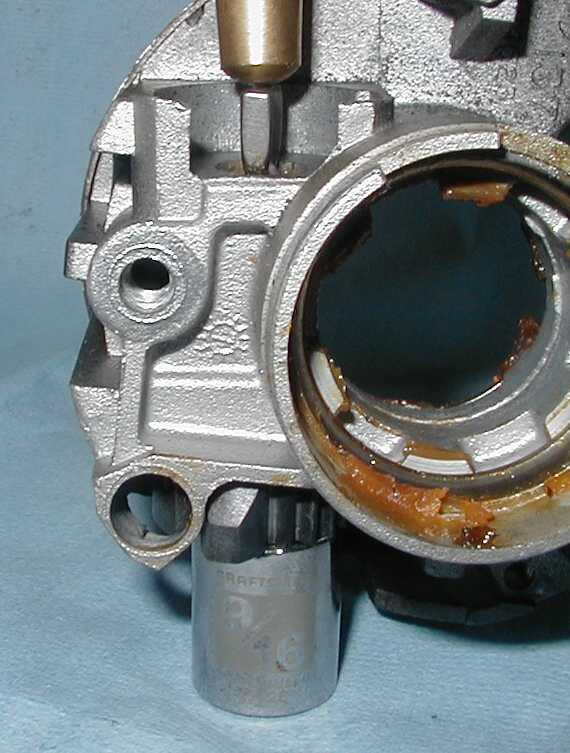 Just be sure and wipe the grease off of the bottle before returning it or you'll have more problems than just a loose tilt assembly. Awesome! What else did you delete during your hizzy fit? Those that want to see the missing article can find it here. I was chasing down a looseness problem that my car has had forever. 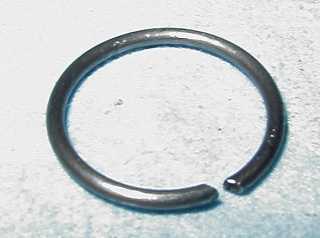 Ever since I've owned my 88 GT, (06/2003) it has always had loose steering issues, not the usual column falling apart thing. The car had 183K on the ODO already. 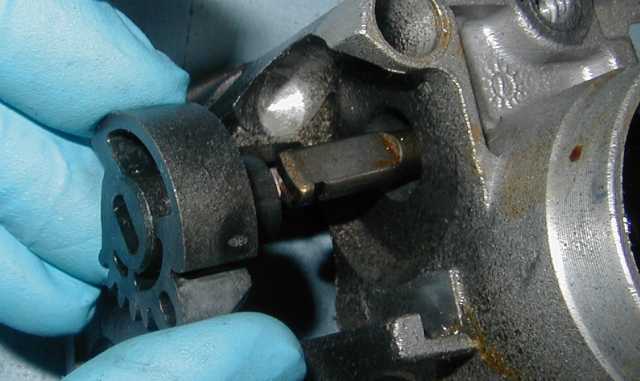 First I traced a large amount of the play to the passenger side steering rack bushing. 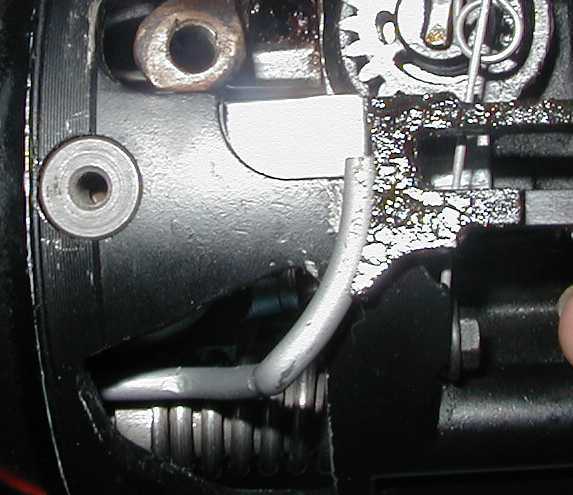 So I pulled the rack and found that not only was the bushing shot, but the rack's whole rack gear was corroded, and rusted pretty bad, and as well, the pinion's shaft bearing had deteriorated and broken apart. I got a good core rack from the local U-Pull-it, did the Rodney dickman bushing, greased the internals, added new bellows and all ball joints and thought this would be the last I'd have to deal with the looseness in the steering. Don't get me wrong, it helped greatly. But It still had some considerable looseness. I gave up on hunting it down for the last 5 years. 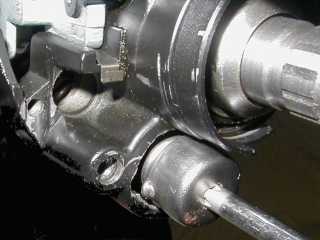 I had rebuilt the whole front end in 2007, only to have no difference in steering yet again. Two days ago I decided that enough was enough. 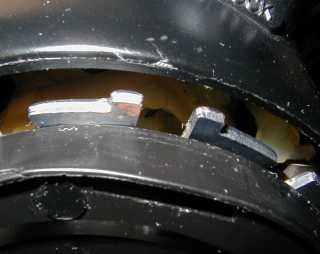 At 243K miles, I've had it with this loose steering. I proceeded to jiggle the wheel and find out if there was any looseness translating between the steering wheel and the rack. 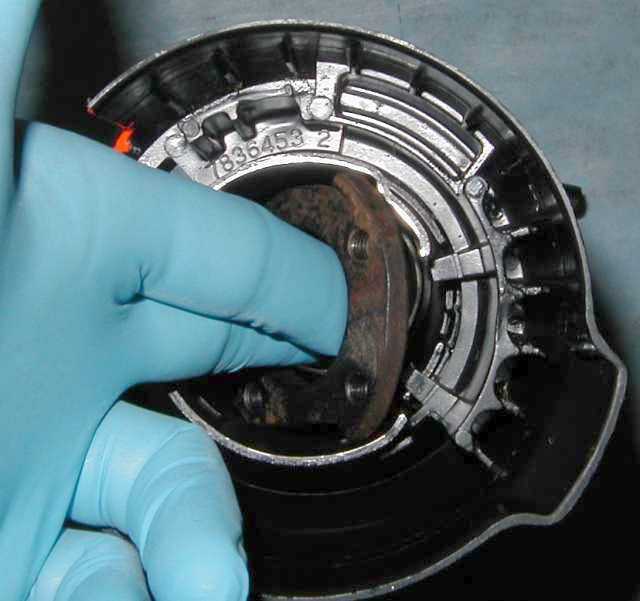 I noticed that the U-Joints under the steering colum were not exactly responsive to steering wheel jiggling. An AH HA moment. Must be something in the column! 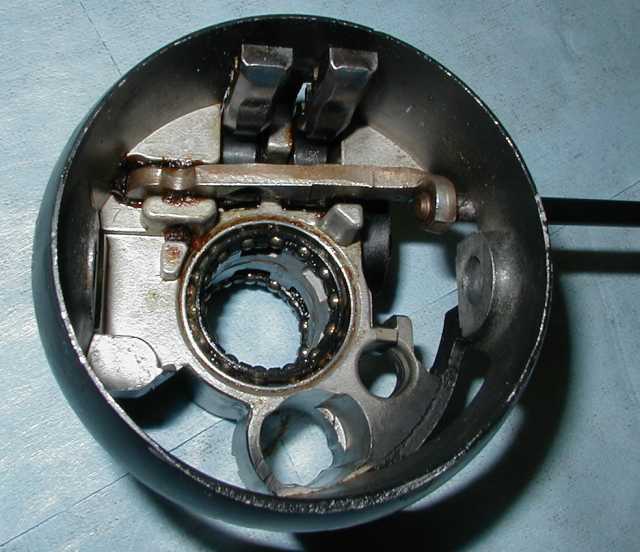 Pulled the steering column apart, and found a great deal of looseness in the U-Joint at the tilt knuckle. 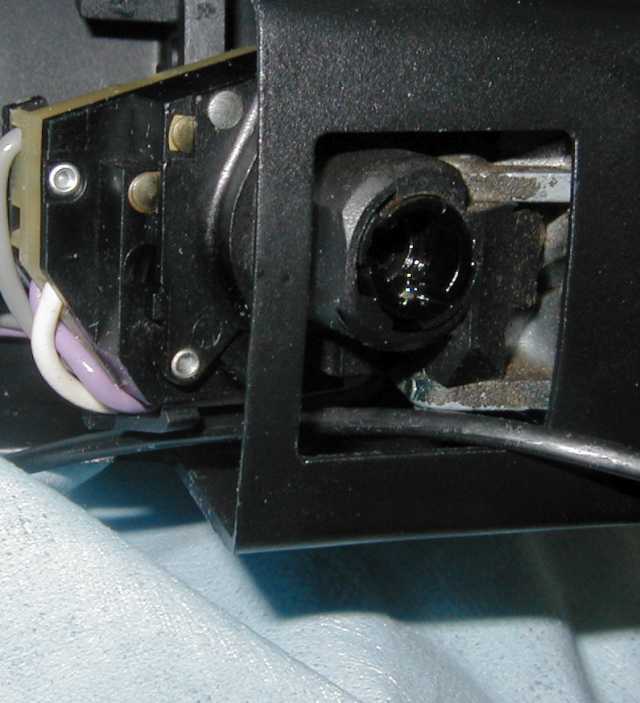 Once I took it apart I found the little wire spring in the center of the plastic ball was broken in half. The joint was loose and flopping about. 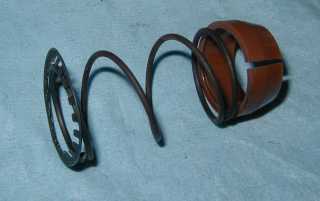 I got a used spring from The Las Vegas Fiero Club (Thanks Rich!) and put it in the ball, and deliberately installed the ball upside down and backwards from its original configuration, it just seemed tighter that way. And presto, the joint wasn't floppy anymore. Got it all back together and into the car and for the first time in the last 60K miles, my car drives like it was meant to. Dare I say it, it feels like a new Fiero. 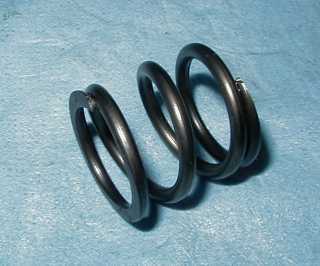 I can't believe that little spring had such a profound effect on the feel of the steering. It always had almost 1/2" of play. I was always fighting the looseness on the highway. I'm very sorry, but I received a notification from JazzMan that he does not want his original post reposted and asked/told me to remove it. 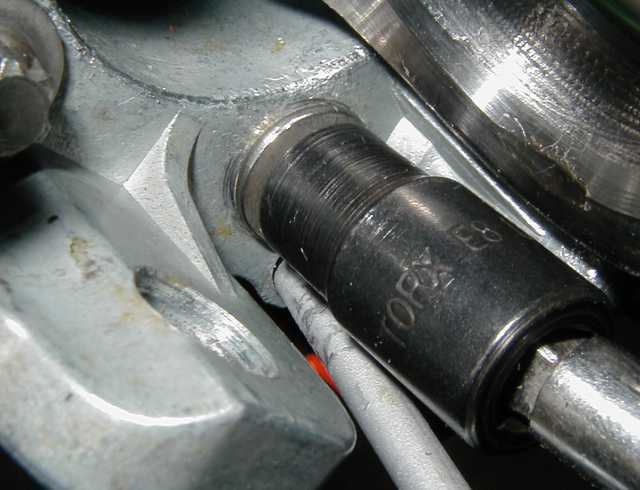 Excellent photo write up on the steering colum fix. I farmed the column fix to my local Fiero mechanic. I couldn't handle the fix myself. How could copyright be involved? It's not his real name and it was an unsolicited posting. Is my advice on this forum my property? Edit: Well I screwed that up somehow. Just say NO!! to Automatic Transmissions!! DRAG RACING - So easy a Caveman can do it! 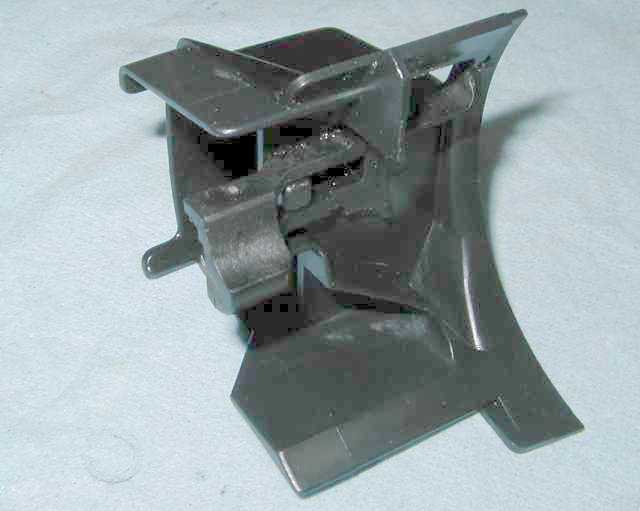 The first time I got into a GM tilt column (or any column for that matter) was when the column in my trusty old '84 Phoenix got so wobbly that it was scaring me to drive the car. 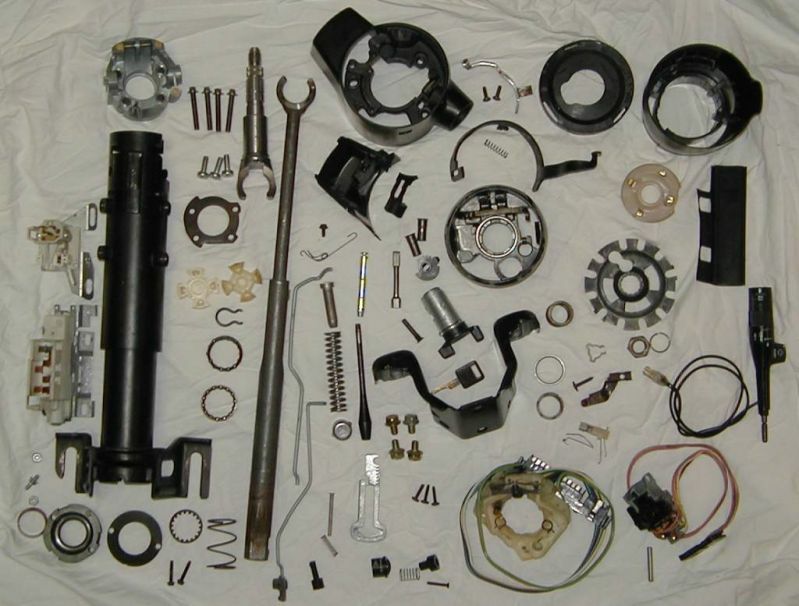 It took me most of a day to repair that column because the factory service manual was terrible, and because I had to figure out how to design and fabricate all the special tools using junk I had on hand. Now, with the benefit of nearly 30 columns repaired over the last few years, I can do the same repair in the car in around an hour to an hour and a half on average, with my best time being just under 40 minutes. I've been wanting to do this topic for a couple years now, and decided that it was time. 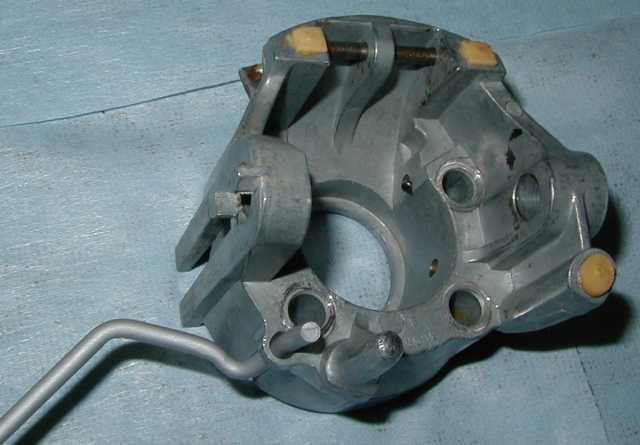 I debated with myself what would be the best way to explore the Saginaw tilt column as used in the Fiero and most other GMs of that era, and concluded that a ground-up assembly would be the most effective. 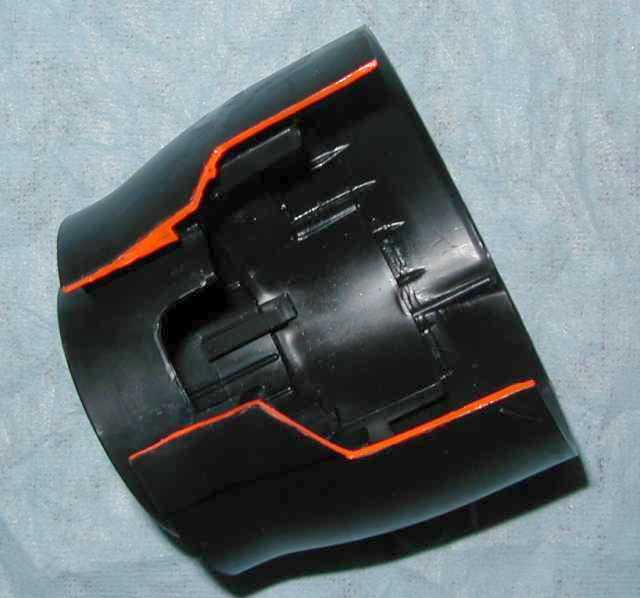 My intent with this topic is to give an in-depth working knowledge of GM tilt columns to anyone interested in their inner workings. I'm also going to create a separate topic that will detail the classic wobbly column repair procedure since it won't require the same level of disassembly as this build did. 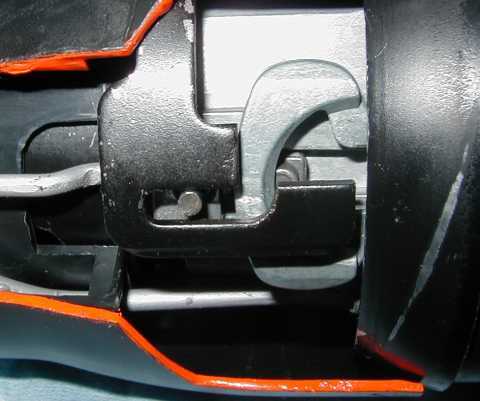 To make the pictures more useful I painted some parts to make them more visible, and more importantly, did cutaways to allow a better view of the complex pivot point component relationships and other hidden details. 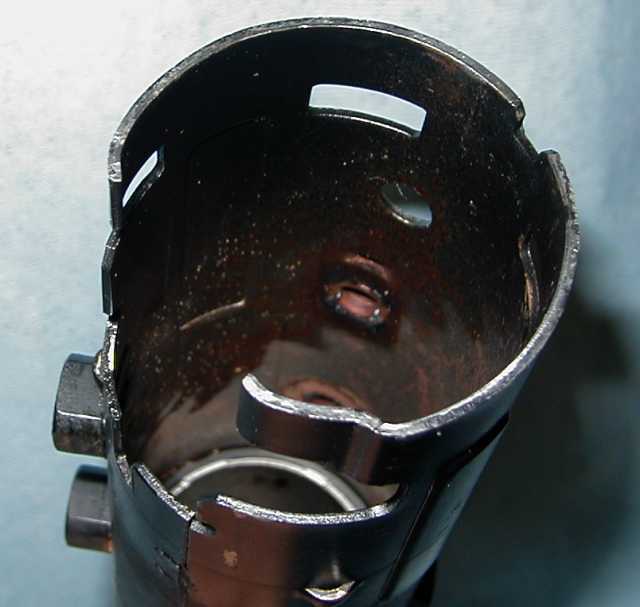 For clarity I also cleaned and degreased most parts that would normally be lubricated, so if you're using this topic as a guide for overhauling a column it is important that all sliding/contact points are lubricated with a good odorless waterproof grease that won't run when hot. 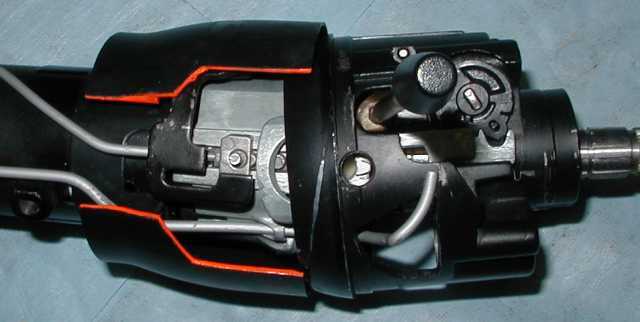 The column shown is for a manual transmission equipped Fiero as indicated by the key release lever. 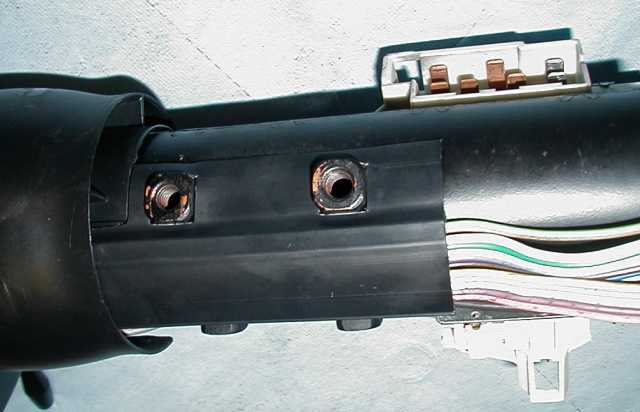 Automatic columns use a different ignition switch that has a provision for an interlock cable that runs to the shifter mechanism. I will detail the internal differences between the two types of columns during the build. 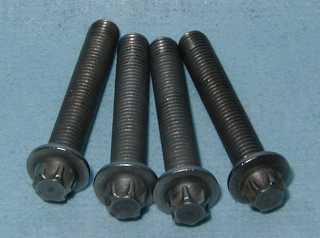 Technically, all of the Phillips-head looking screws are actually Pozidriv head, but Phillips drivers will work just fine for occasional use. 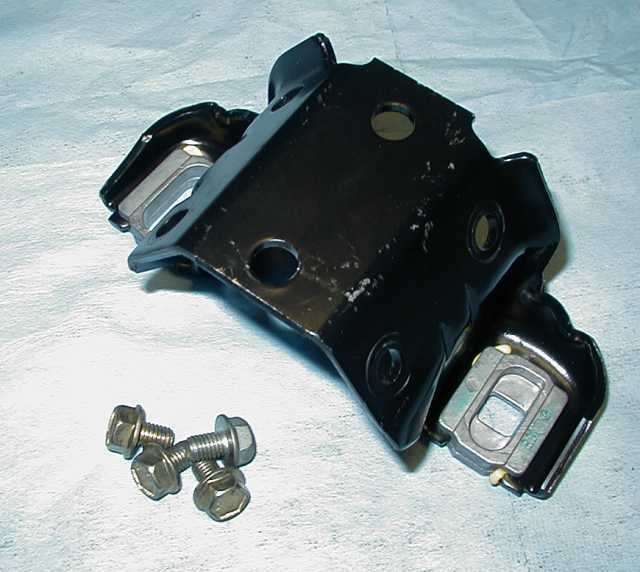 You'll also note that a combination of metric and SAE fasteners are used. This is because the Saginaw plant where the columns were built still used SAE tooling whereas the GM assembly plants where the columns were installed were fully metric. 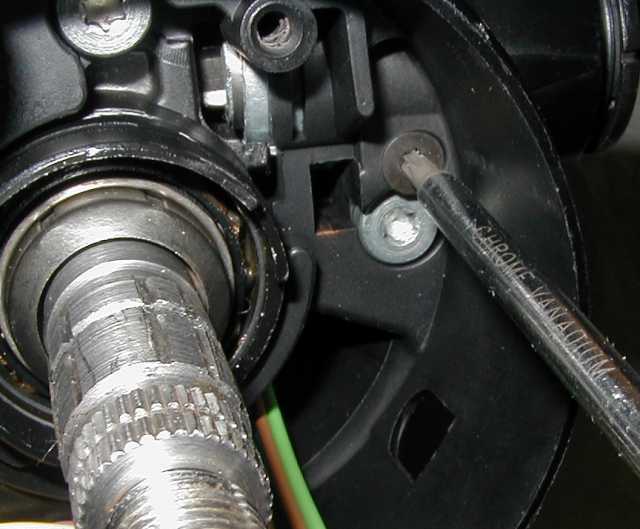 Thus, the internal fasteners in the column are SAE and the fasteners that connect it to the vehicle are metric. 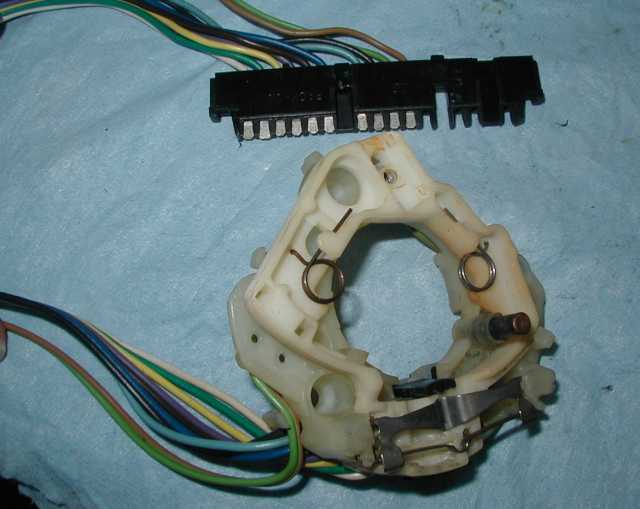 We'll adjust the ignition switch later, after the column is fully assembled. 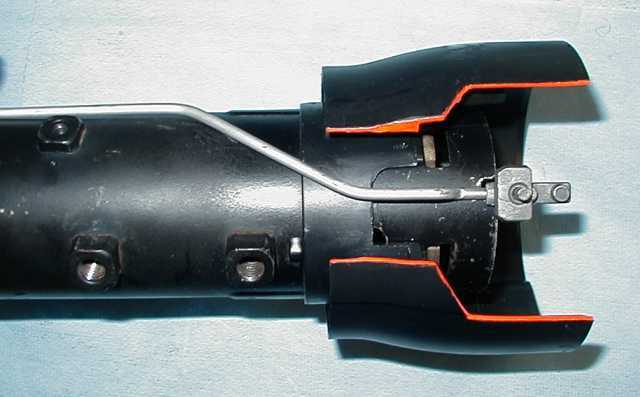 This plastic key will shear when the torso hits the steering wheel during a severe collision, allowing the shaft to collapse into the tube instead of punching your heart out through your spine. 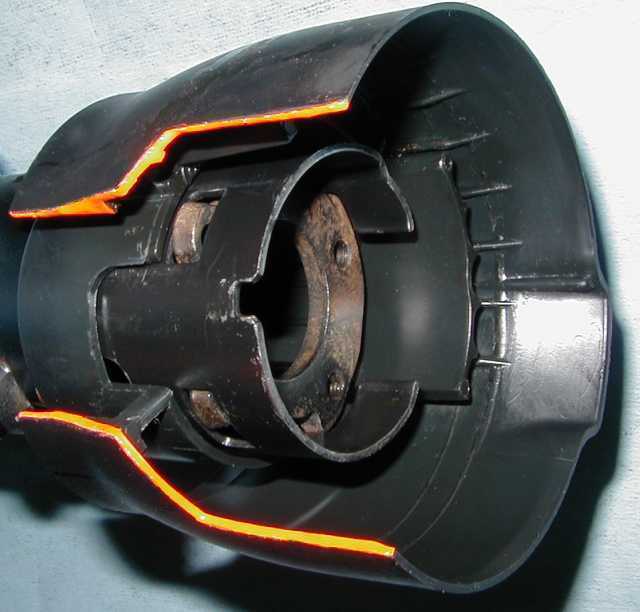 When a column is dropped on its end or a hammer is used to knock the steering wheel loose this is the part that is typically damaged, causing the column to rattle over bumps and sometimes feel like it has slack with a "click" feeling. 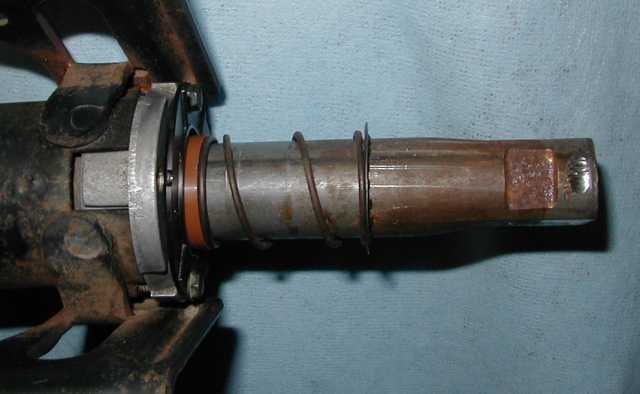 Once this happens the shaft is considered non-repairable. 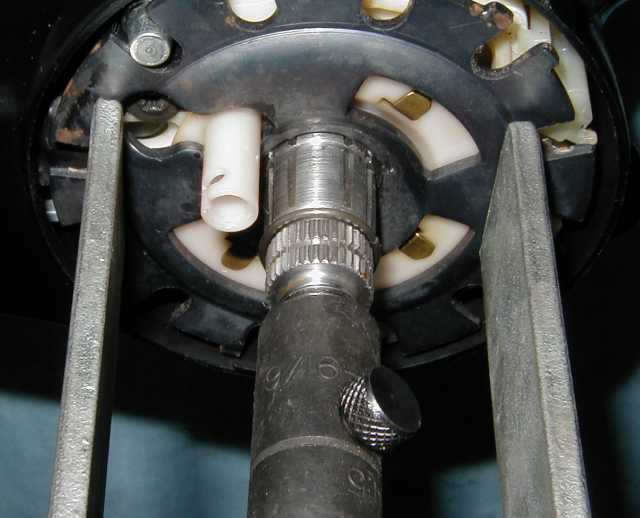 Insert the main shaft "C" into the ball at a ninety degree angle, there's a slot in the stub shaft for this, then straighten the two shafts until they are aligned, thus locking the shafts together at the ball joint. 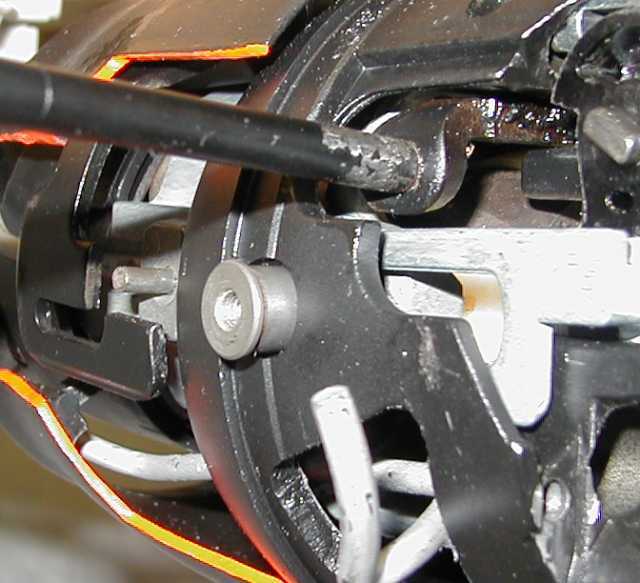 There should be strong friction as the shafts are aligned and no play when you are done. 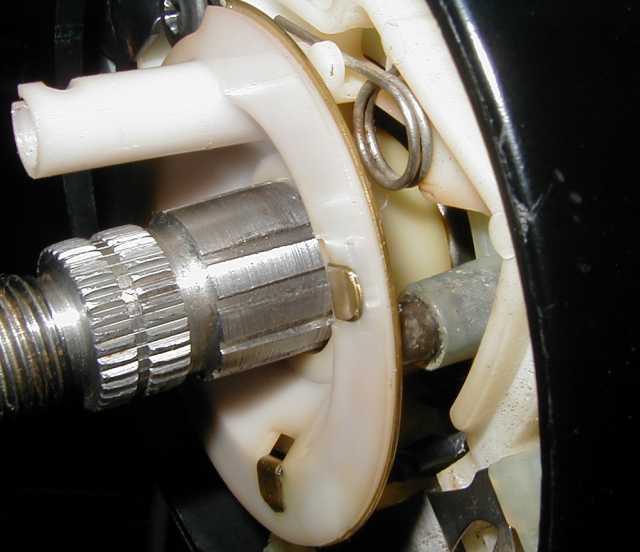 The spring between the ball halves pushes them apart, taking the slack out of the ball joint. 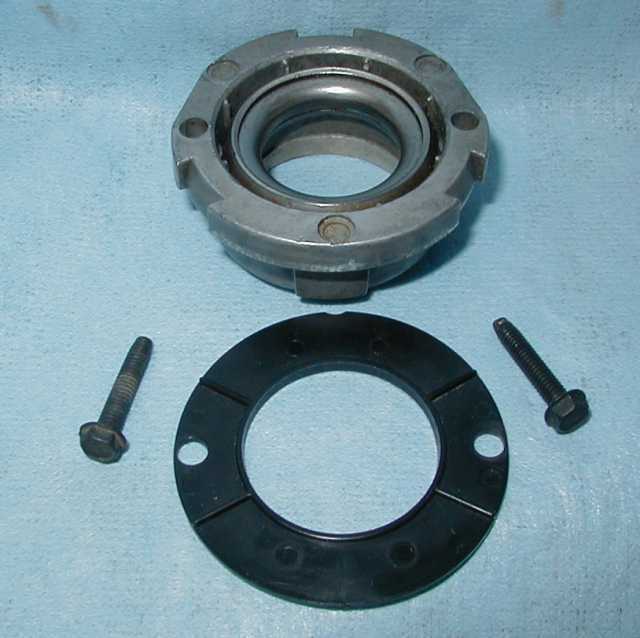 Insert the shaft assembly into the tube and out through the lower bearing. 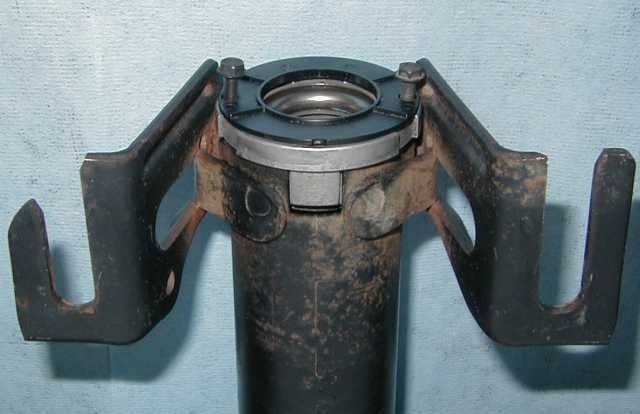 The upper housing contains most of the bits of the column. 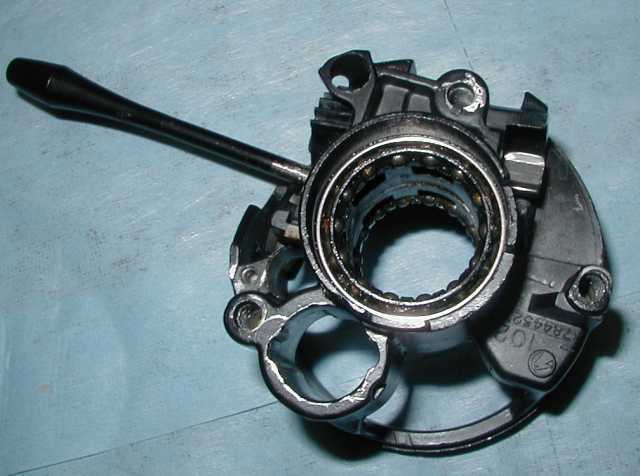 We'll start by installing the ignition lock cylinder cross shaft and gear. 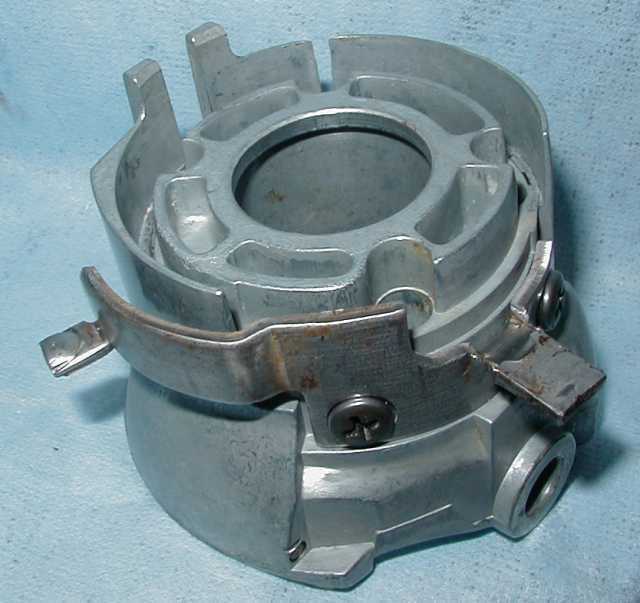 The upper housing also contains the upper and lower bearings for the stub shaft. 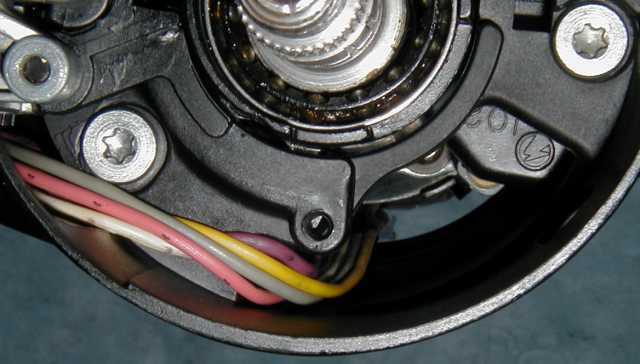 When turning the steering wheel these bearings are what keep the wheel feeling "tight" as it rotates. 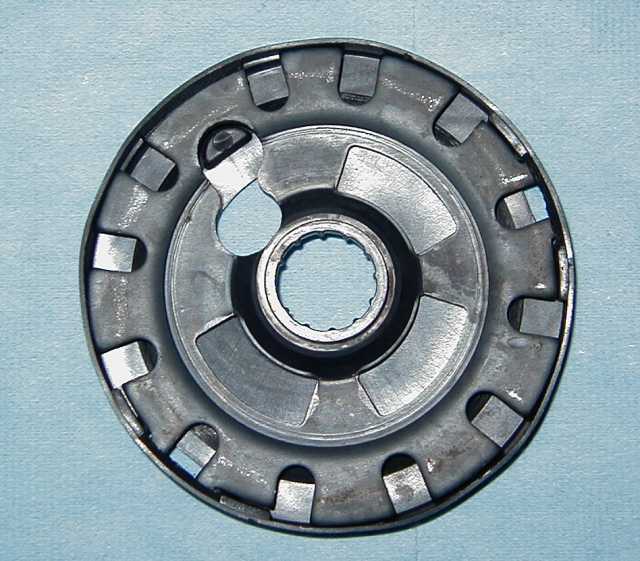 The bearing balls are equally spaced in the upper housing by slotted retainers. 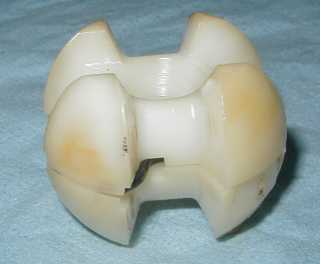 Use grease to hold the balls in the retainers, then set the retainers into the races using more grease to hold them in place. 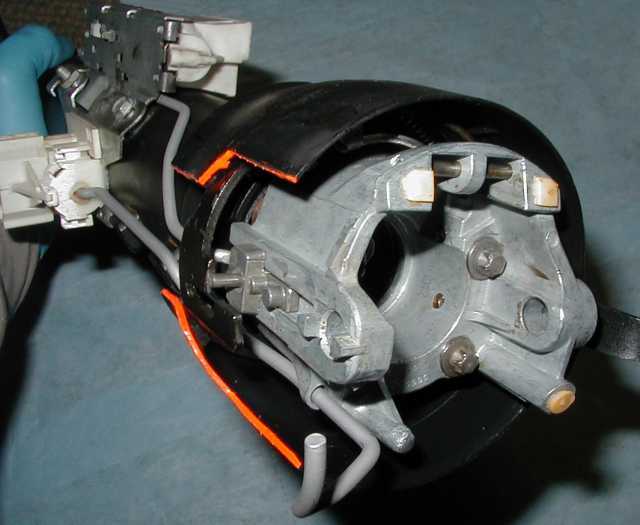 The following pictures show the upper and lower bearings installed, with the tilt release lever installed for visual reference. Next will be the hardest part for most people, so I'll devote extra pictures and explanations of the parts relationships to help with this task. 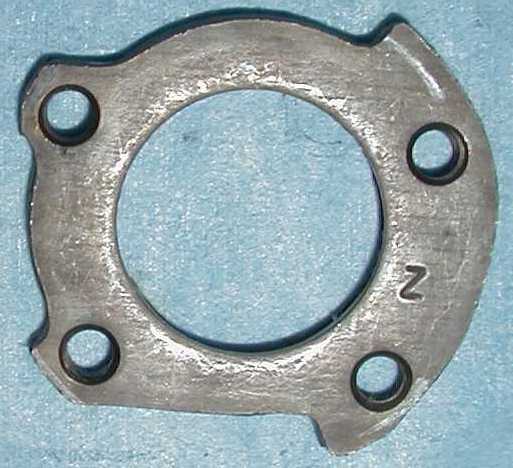 I'll begin with a brief description of how the various linkages work through the pivot point. 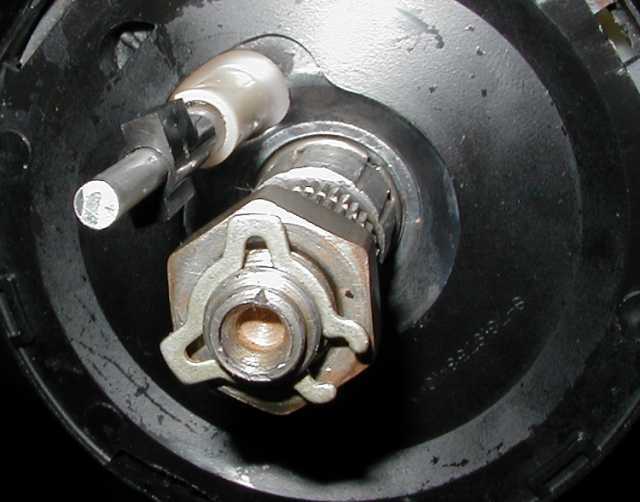 The ignition lock cylinder turns a cross shaft that goes through the column and into a gear. 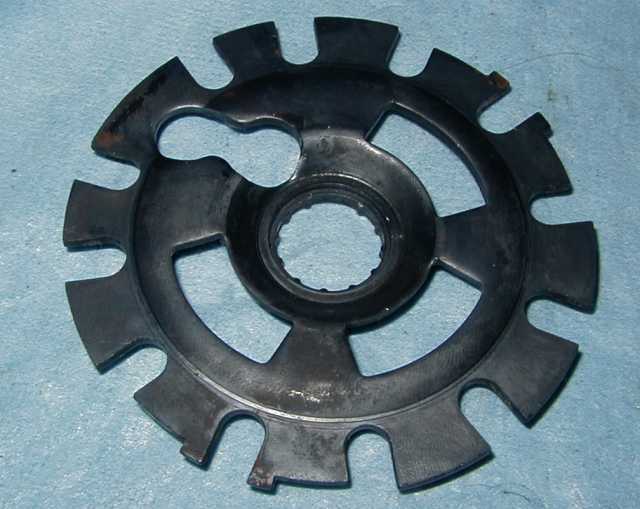 The gear engages a rack on the sector that moves up and down the column as the key is turned. 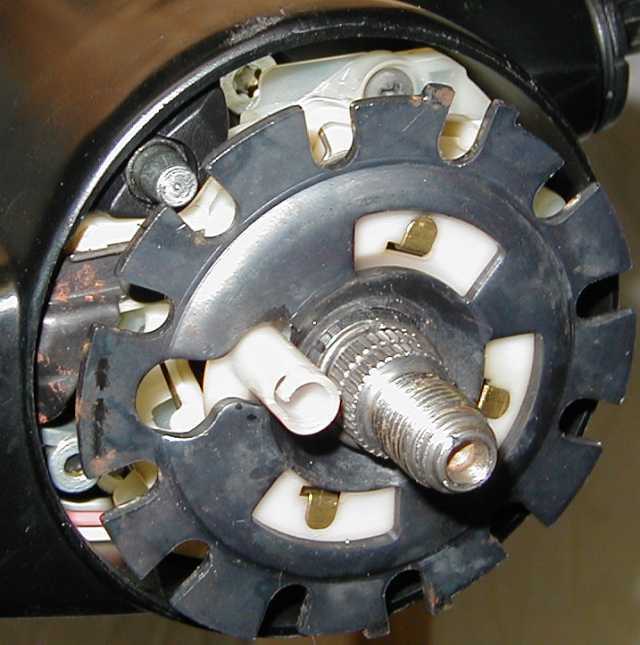 The sector has an arch on the lower end that fits between two pins at the top end of the ignition switch pushrod which in turn goes down the length of the column to where it connects to the actual ignition switch. 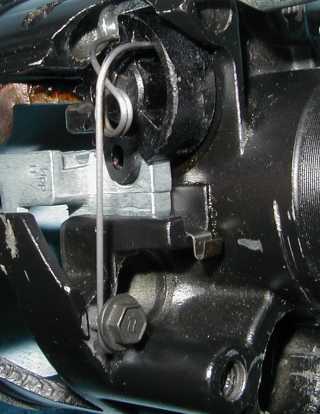 The arch stays connected to the ignition switch pushrod as the sector rotates about the tilt pivot pin when the column is tilted, without moving the pushrod. 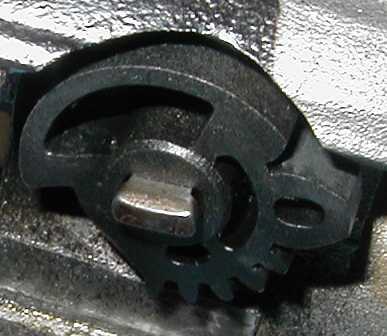 The pushrod pulls up as the key is turned toward the START position, and pushes down as the key is turned to the OFF position. 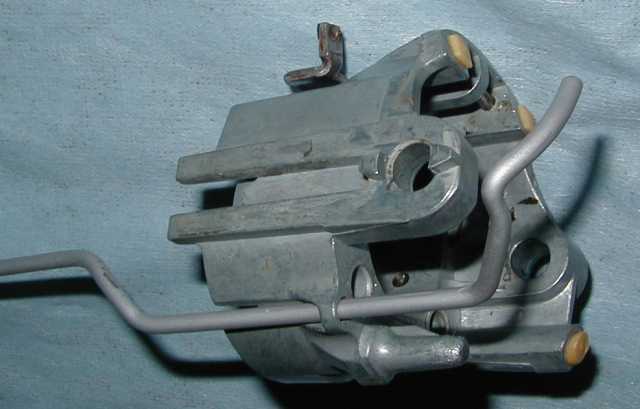 The high beam linkage is different, its pushrod goes past the tilt pivot pin and through the upper housing, then bends up into an arc. 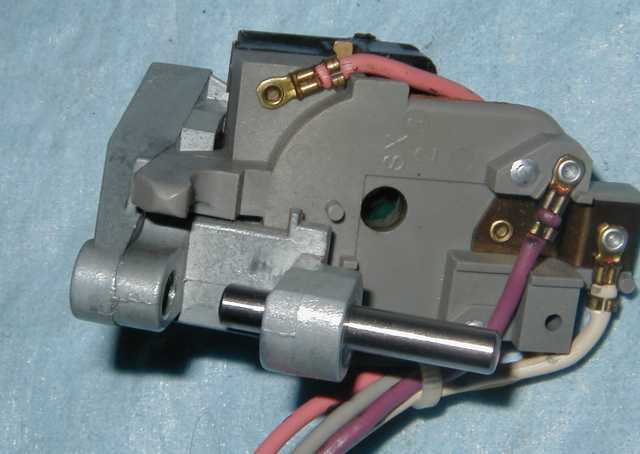 There is a curved follower that pushes against the arc of the pushrod, that follower in turn is pushed by the wiper switch which rotates on a pin when the turn signal stalk is pulled back. 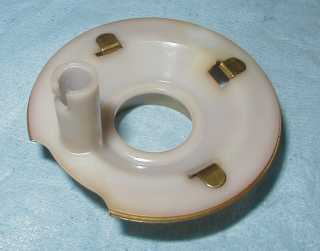 The curved bottom of the follower slides along the arc of the pushrod as the column is tilted up and down. Now to assemble the upper housing assembly to the lower portion of the column. 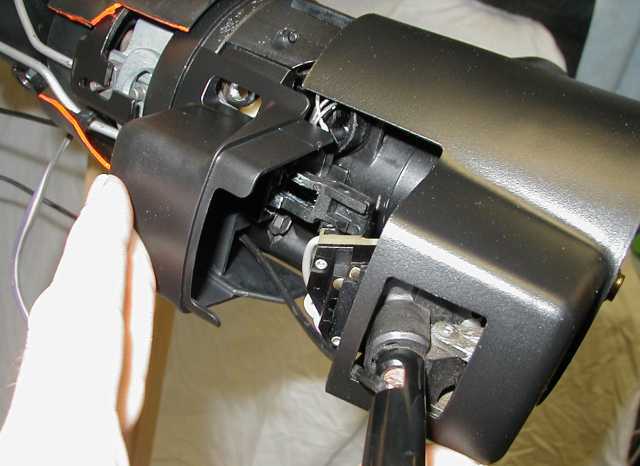 There are several things that need to be accomplished simultaneously while installing the upper housing assembly. 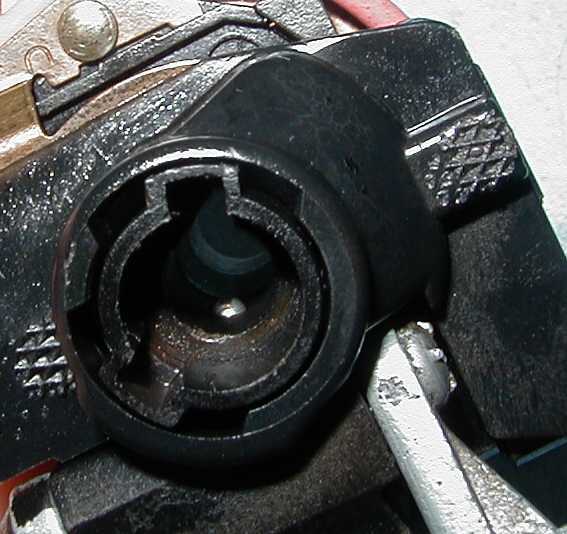 The ignition sector needs to properly engage the pegs on the ignition switch push rod, making sure that the pushrod end fits into the groove in the side of the lower housing. 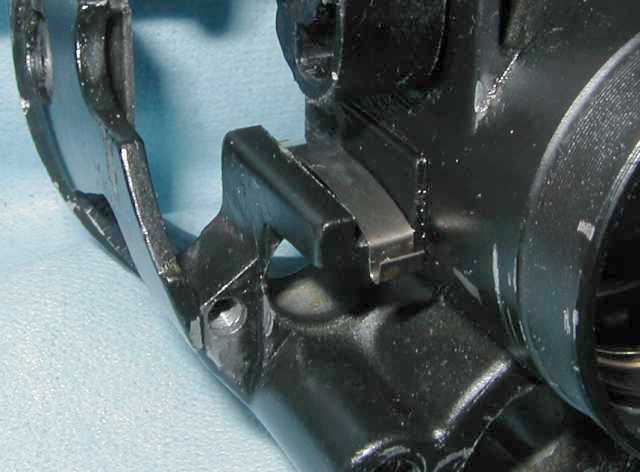 The high beam pushrod needs to be properly located through the lower left quadrant of the upper housing, the tilt pawls need to properly engage the pins in the top of the lower housing, and the pivot pin holes need to be aligned. 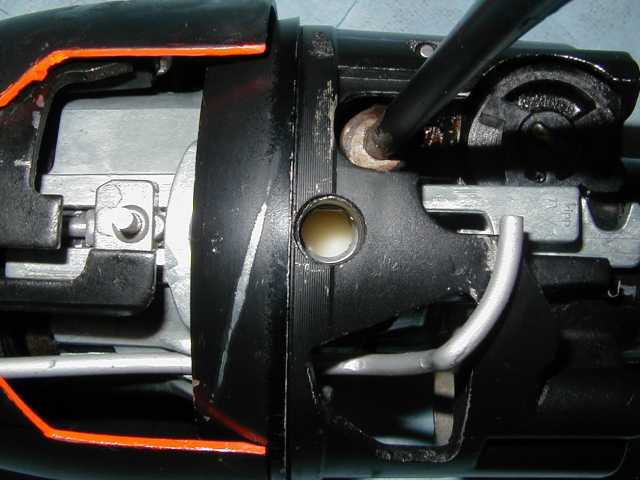 On manual columns the key release lever slot needs to engage the pin sticking out of the top of the ignition pushrod. 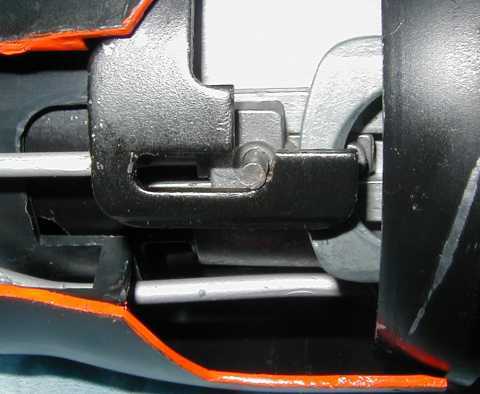 Also, the lock pin needs to stay properly engaged as it tends to fall out during this step. Though this is the most intimidating part of the build, it's actually not as hard as it sounds. 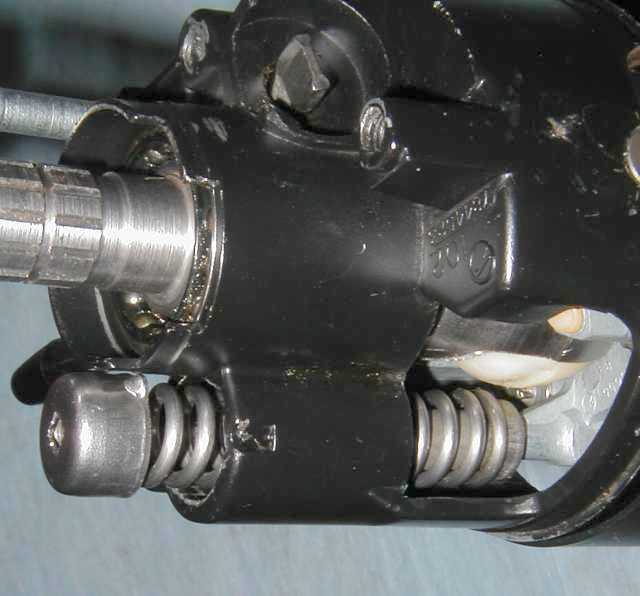 One helpful tip is to keep the stub shaft pulled toward you as you maneuver the upper housing into place, this will help keep the balls in the lower race from being accidentally dislodged during this part of the assembly process. 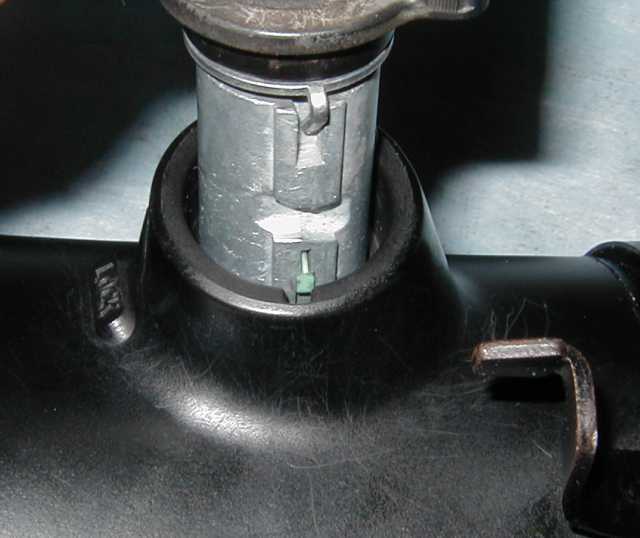 Start by pulling the ignition switch pushrod all the way up toward the top of the column. 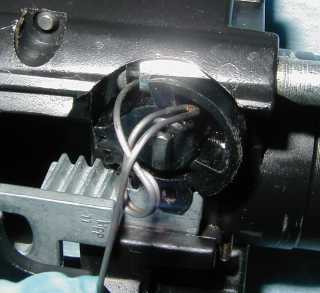 Pull the high beam switch pushrod up, but not past the bend in the rod. 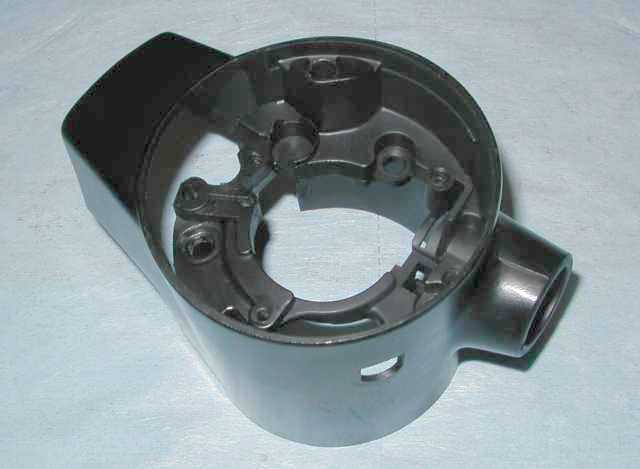 Insert the stub shaft into the back of the upper housing assembly as you bring the housing assembly toward the lower housing. 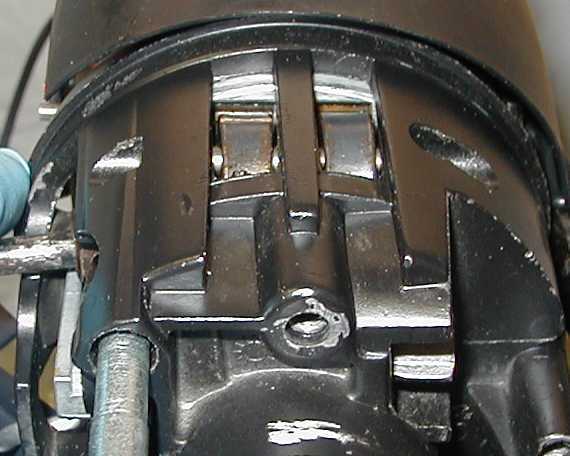 Rotate the upper housing assembly clockwise about 1/4 turn, this should be enough to allow working the upper end of the high beam pushrod through the large hole in the lower left quadrant of the upper housing assembly. 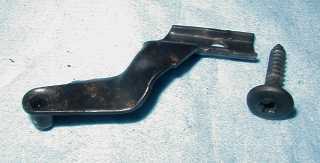 It is assumed that the tilt lever is installed at this point. 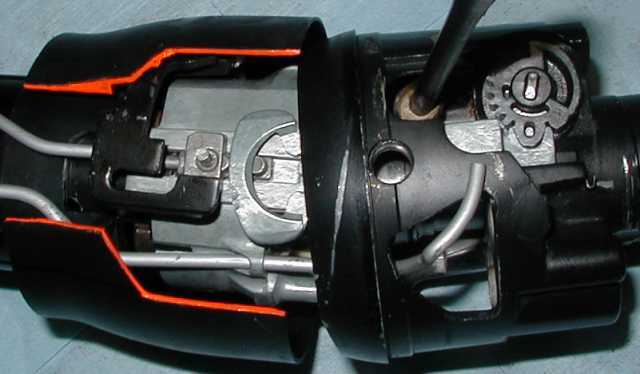 Make sure the sector is properly engaged by holding the upper housing in place while turning the ignition switch cross shaft to verify that the pushrod moves up and down properly. 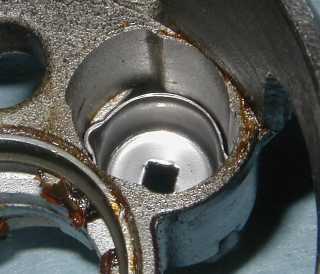 Use a brass punch and hammer to tap the pins in until they're flush, then again verify that the ignition switch pushrod is properly engaged by rotating the cross shaft in both directions and checking that the ignition switch pushrod moves both up and down. 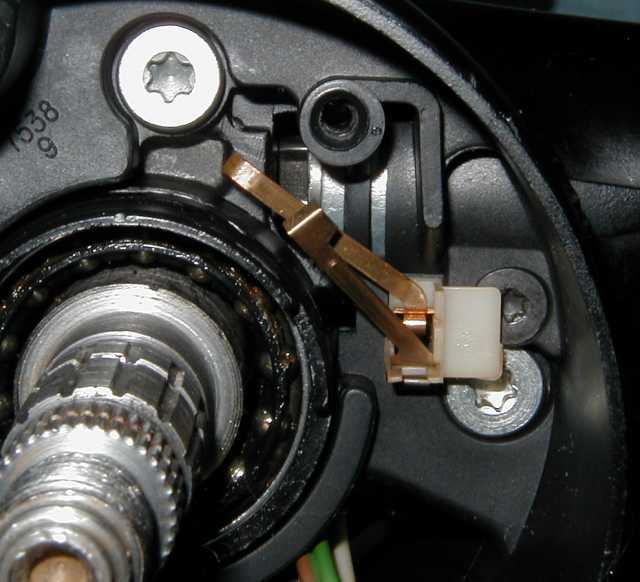 You can use the ignition lock cylinder as a convenient way to turn the cross shaft. 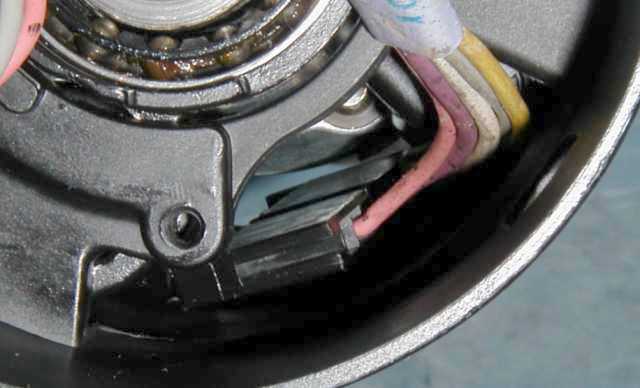 Here's an explanation of how the ignition key release lever functions in the manual column. 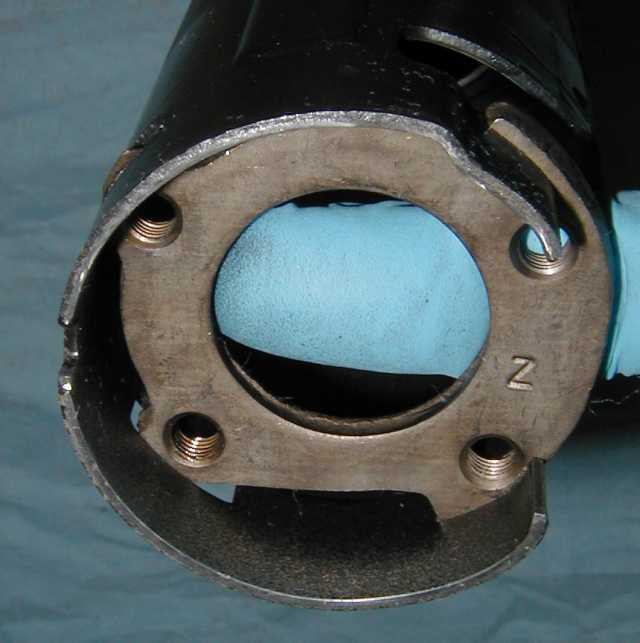 The key release lever (pictured earlier) wraps over the top of the column inside the lower shroud. 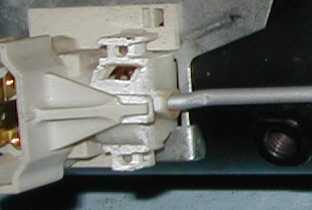 On the left side of the column the lever has an L-shaped notch in it. 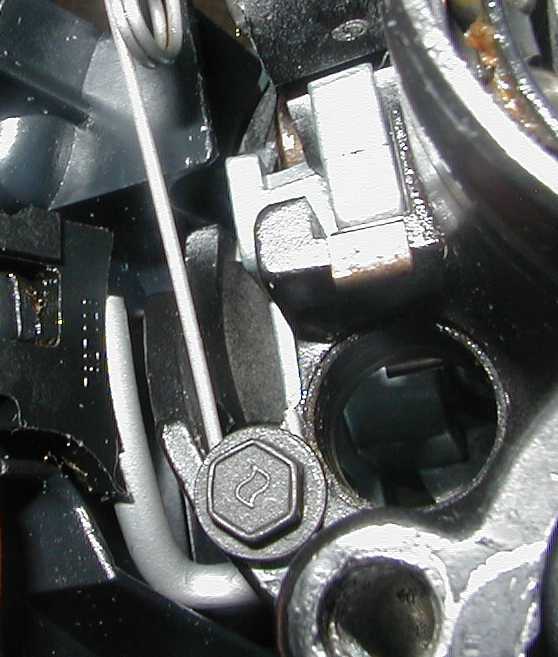 There is a pin that sticks out from the top of the ignition pushrod (autos have the same pin that doesn't do anything) that fits into that notch. 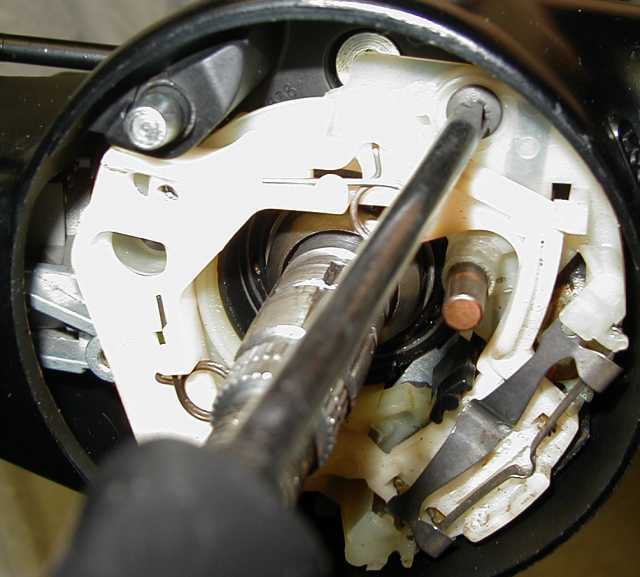 As the ignition lock cylinder is rotated to the OFF position the sector pushes the ignition pushrod down until the pin hits the end of the notch and stops the key from turning any further. 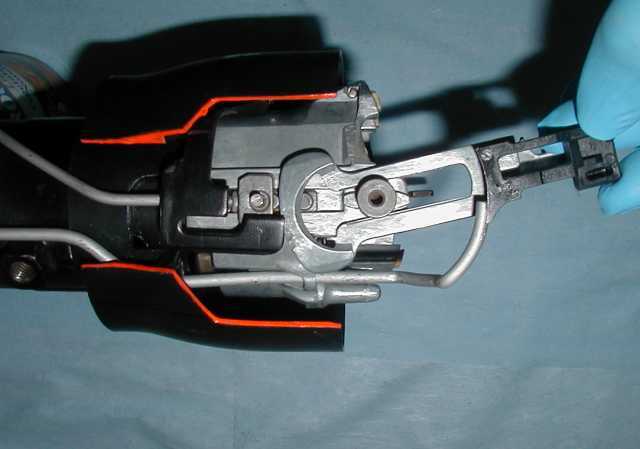 This is the OFF position of the ignition switch. 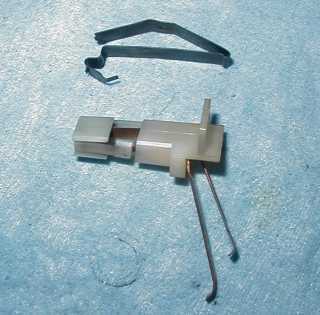 Depressing the key release lever rotates it clockwise and raises the L-shaped notch such that the pin can now move further down as the key is rotated to the LOCK and ACCESSORY positions. 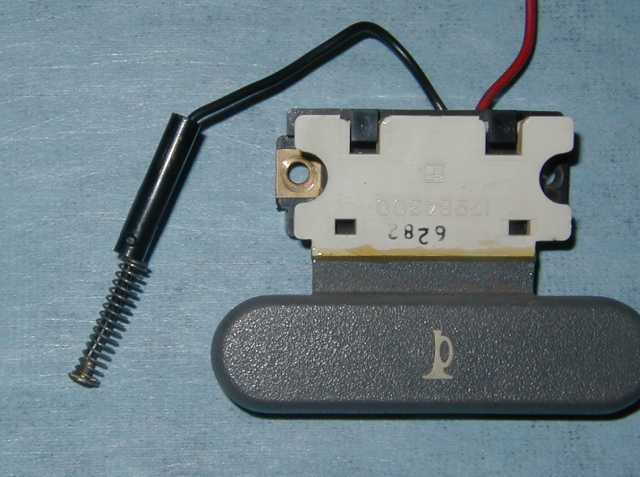 Since the release lever is spring loaded the notch will pop back the next time the key is turned forward. 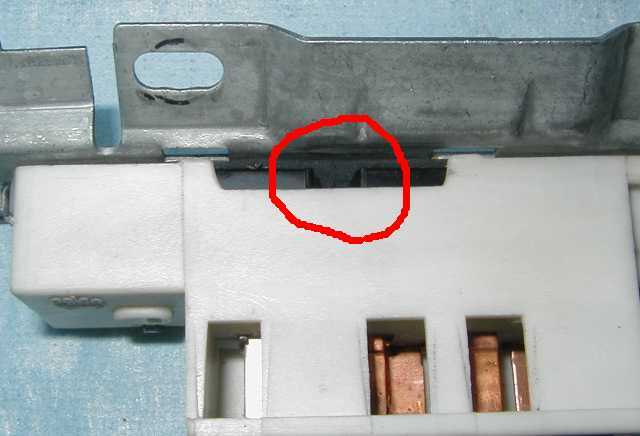 You'll note that the open area below the ledge (as viewed from the top side) doesn't have a bottom, so you can push the cap down as far as you want without worrying about damaging it. 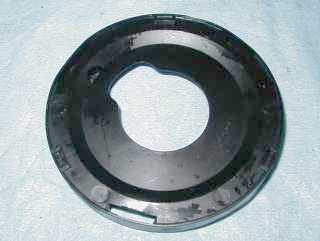 The cap only has to go in about a quarter inch or so to get the ears past the ledge before rotating it to the locked position. 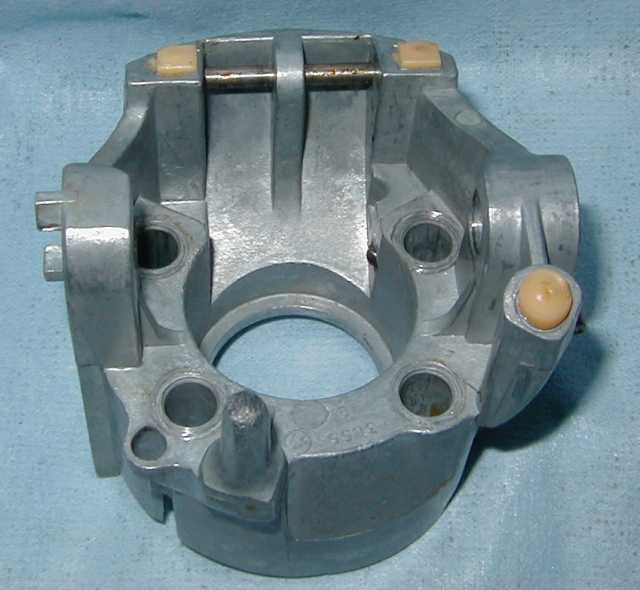 It is important to keep the cap square to the bore, otherwise the steel ears will dig into the aluminum housing and get stuck. 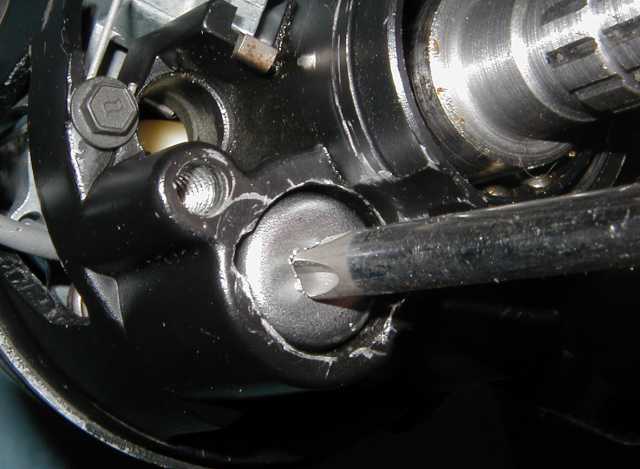 A Phillips screwdriver works well for keeping the cap straight when inserting it. 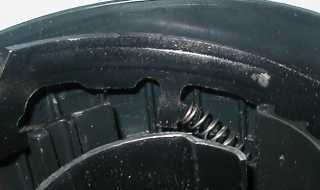 Use a large Phillips screwdriver to push the cap down with the ears aligned to the grooves in the sides of the hole. 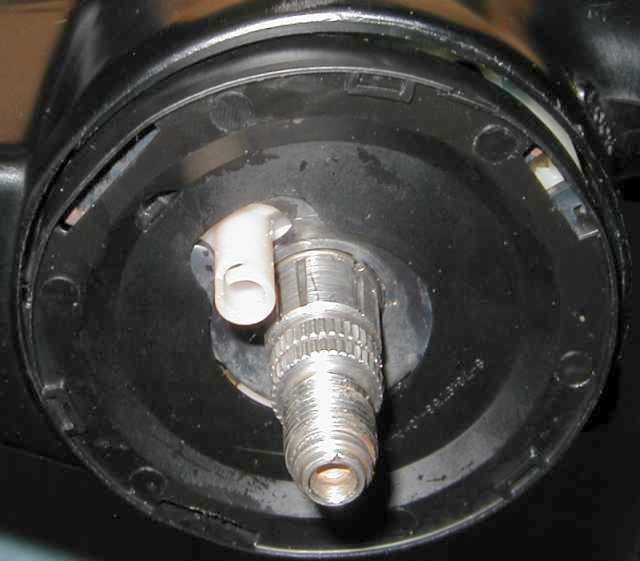 When the cap is deep enough turn it about one quarter turn to the right to lock it into place. 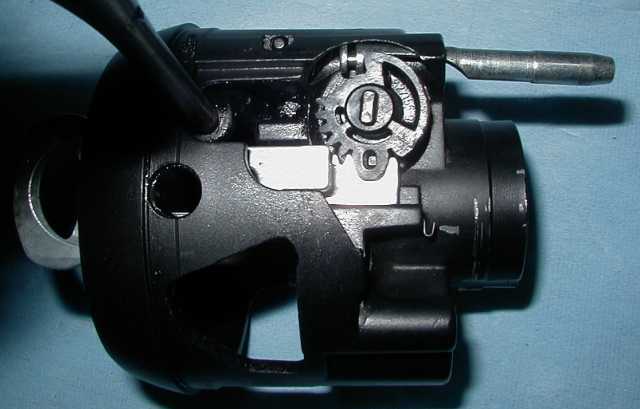 Tilt the upper housing down to the straight position, then remove the tilt lever. Install the tilt lever now. You can see the lock pin visible at the upper left. 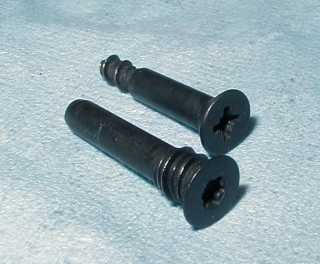 There are two kinds of lock cylinder retainer screws used on Fieros, the '84-'86?, and the '87-'88?. 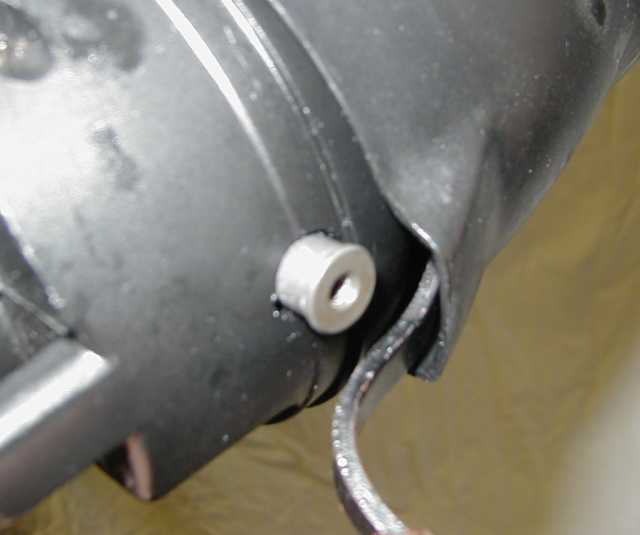 The early screws use a Phillips head screwdriver and have the threads on the end of the screw, and the later screws use a T-20 Torx driver and have the threads up under the head. 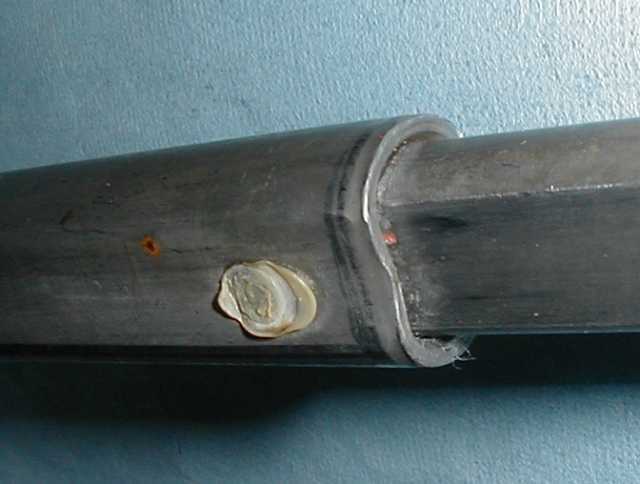 Note: The upper shrouds are different as well due to the two different thread locations, though they will interchange on the column as long as the matching screws are used. 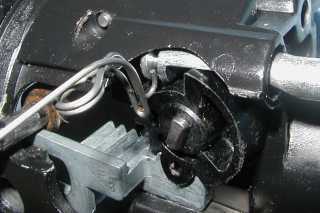 Insert and tighten the lock cylinder retaining screw. 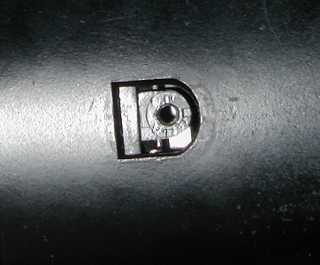 Note, the late style screw has a double helix. 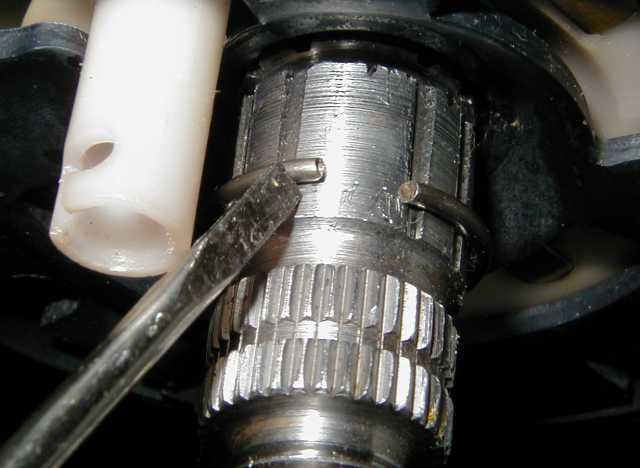 Whenever reinstalling self-tapping screws into plastic it is a good idea to turn the screw backwards until you feel the screw "drop" a little, this indicates that the threads are engaged and the screw can be retightened without damaging the plastic threads in the part. 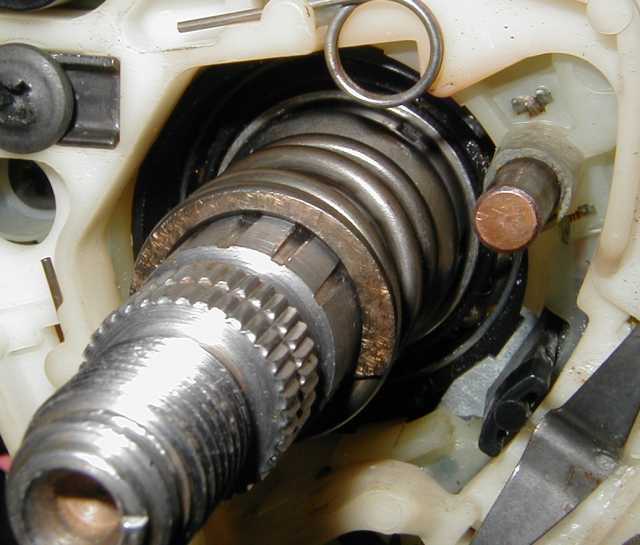 The double helix on the late screw has two different heights, so if it seems to be hard to tighten down you may have to back it out to the second "drop" to make sure the threads are correctly engaged. The switch should be fully seated in the hole. 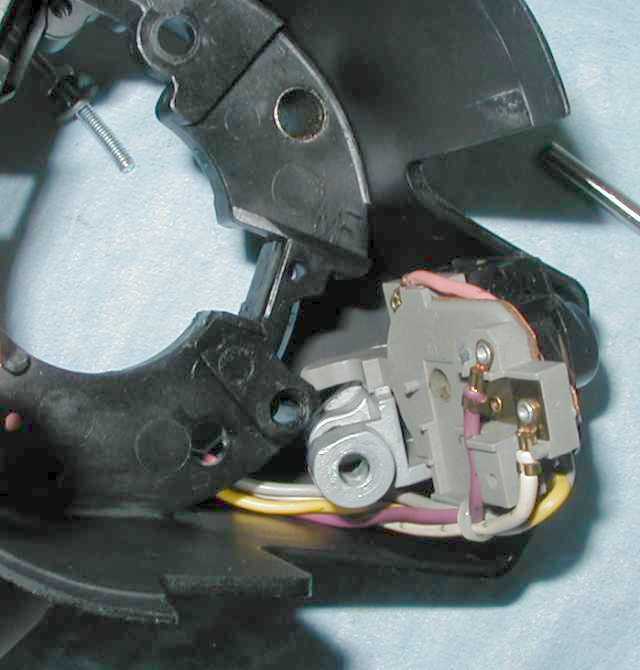 The two metal tabs sticking up contact pads on the back of the turn signal, then to two wires in the turn signal harness. 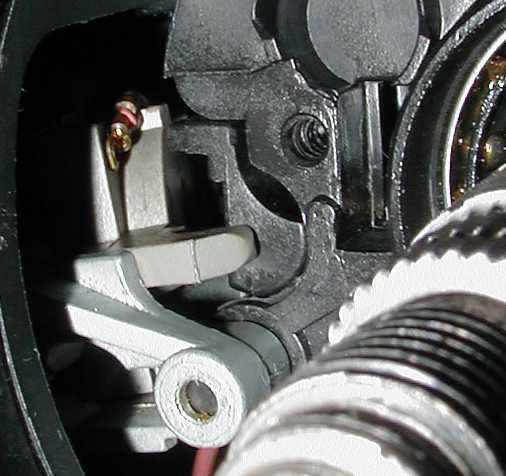 When the key is insterted into the lock cylinder the key tip pushes the green plunger outward, depressing the key presence switch contacts and closing the key presence circuit to the blue chime unit. Move the switch back to the center position. 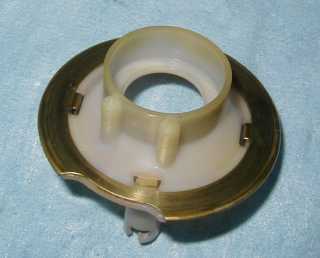 Ensure that the fingers of the preload cup fit down inside the race all the way around. To retract the lock pin out of the way I put the key in and turned it to the RUN position. 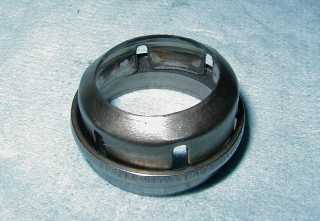 Once the retaining ring is seated remove the compressor tool. 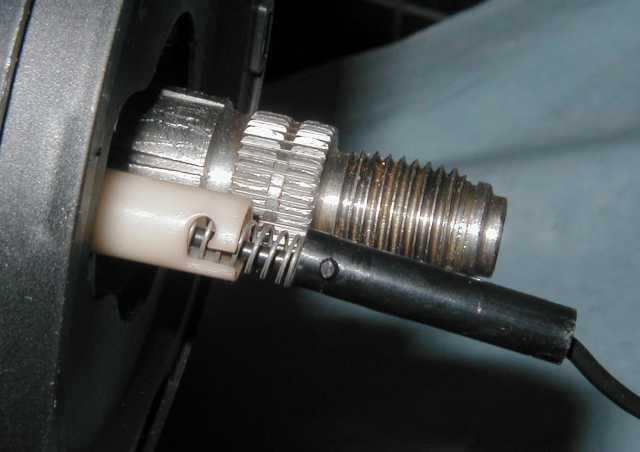 Note: The cruise wire doesn't go through the sleeve. 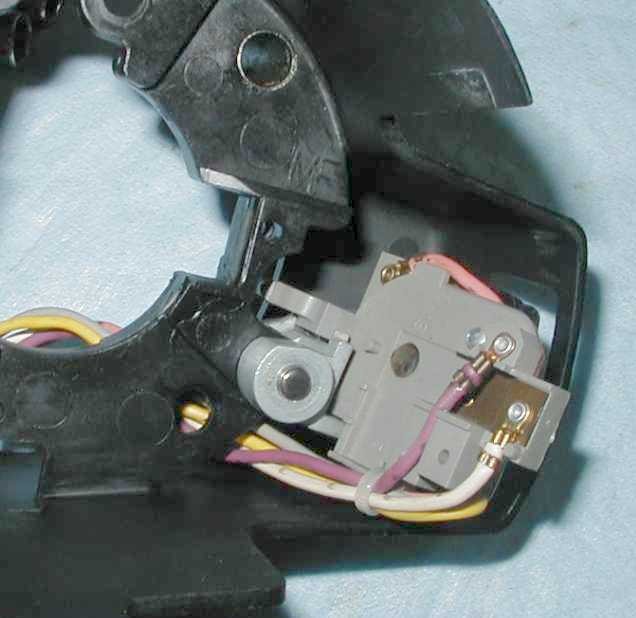 The last thing to do is to adjust the ignition and high beam switches. 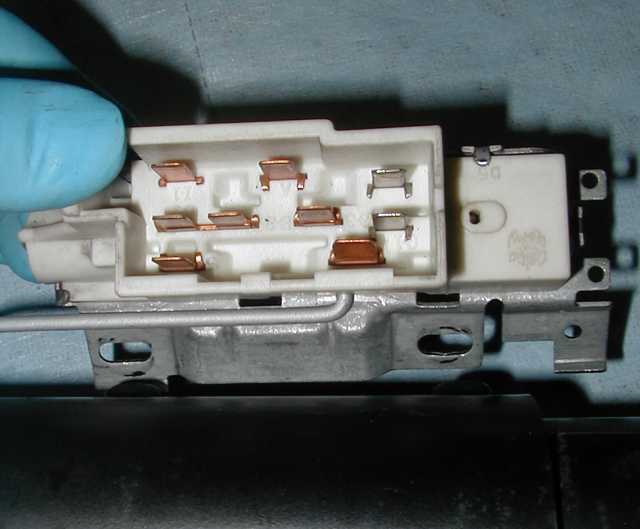 Start by removing the high beam switch bolt and nut, then the switch. 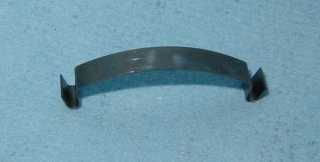 Rotate the key to the LOCK position. 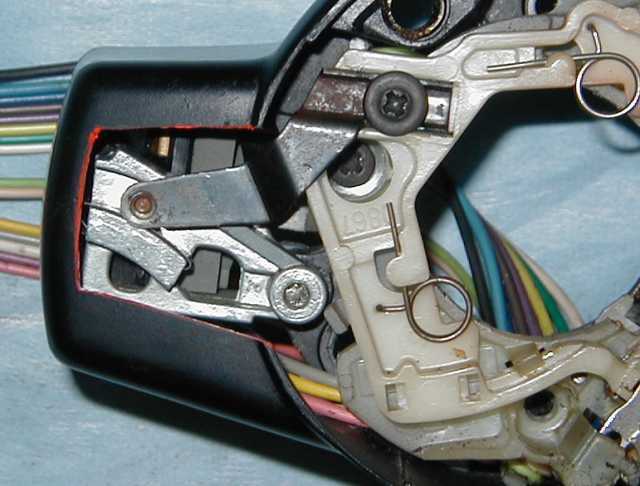 Loosen the stud-headed bolt that retains the ignition switch, then slide the switch so that it "detents" into the off position, this will be the second to last detent on the switch. 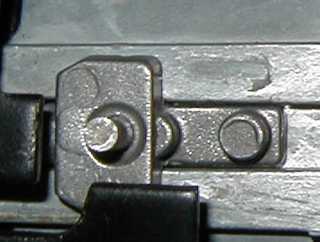 Retighten the bolt, then turn the key to the various positions while observing the switch movement and detent positions. Reattach the high beam switch making sure to get the end of the pushrod properly engaged in the switch socket, then adjust the switch to remove the slack from the pushrod. Tighten the nut and screw and that's it, you've successfully built a GM tilt column from scratch. 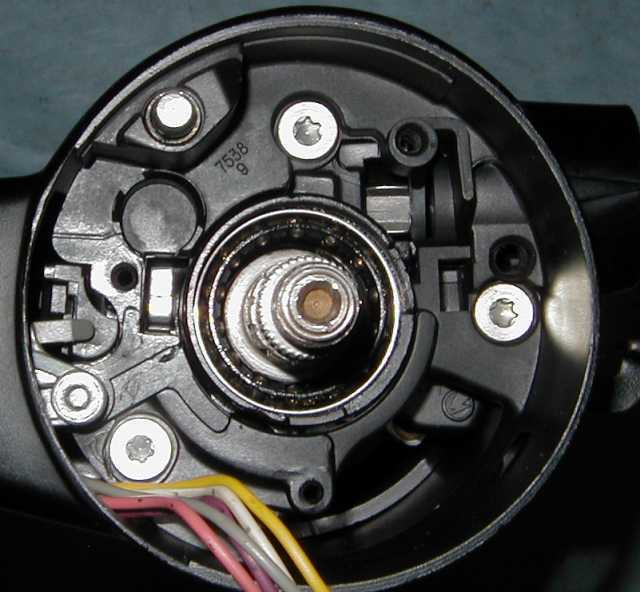 After installing the steering wheel, here's how the horn button contactor goes into the cancel cam. 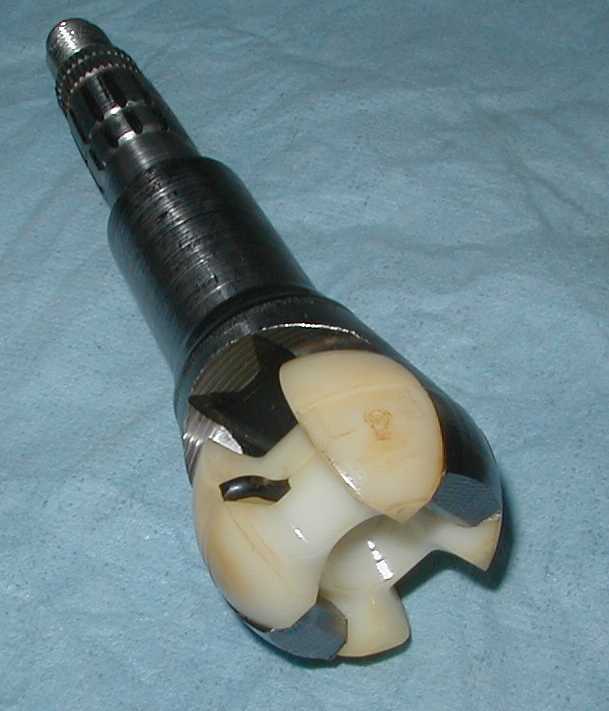 The marks typically will align with the wide spline on the top of the stub shaft. Comments, suggestions, and questions are welcome, and I will revise and rephotograph as requested to make this post more complete. Legal disclaimer: No furry critters were hurt during this, though several were fed. This may not be reproduced in whole or in part, or distributed in any way without me knowing about it, especially if there's money involved. In fact, if there's money involved I want a cut, and not the kind that needs stitches either. 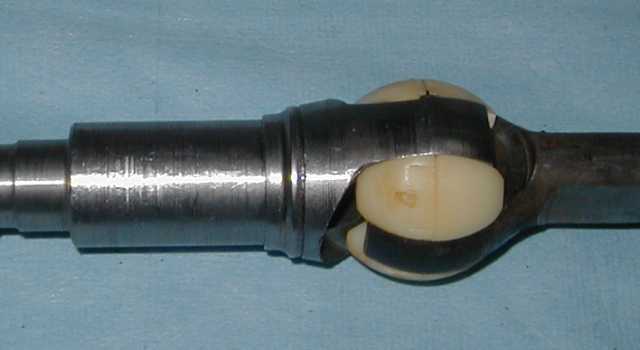 Column assembled on a closed course by a professionally unpaid mechanic. Do not attempt without adequate safety gear and tools. Not responsible for lost kittens or marbles. Your mileage may vary. 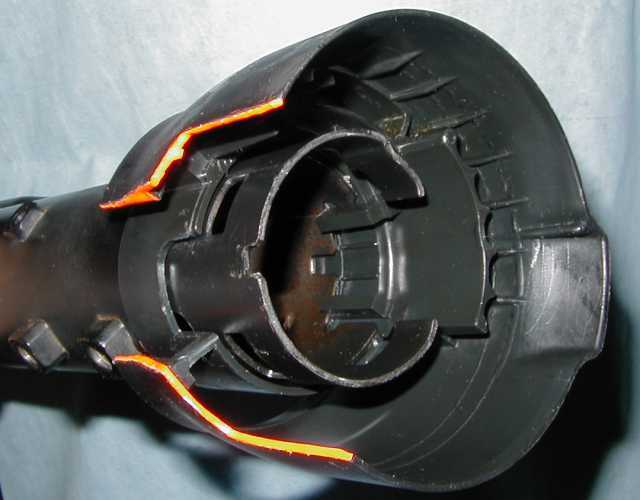 Remember, a column is a critical part of the car's operating and safety systems, sloppy workmanship can kill. Today I got an email from Jazzman asking me to remove the information quoted by twofatguys above because he claims it's copyrighted information. This prompted me to contact a lawyer specialized in Dutch copyright laws. PFF and its server resides in the Netherlands, therefore Dutch law applies to any and all content posted on this forum. This even grants me the right to restore Jazzman's original posts (the ones he deleted). That's good news. Thanks for going to the trouble, Cliff. We all should be aware that when you hit the 'submit' button.....it's property of 'the cloud'. Well, not necessarily - not in every country. For instance, in Australia laws are completely different and he would be able to demand his posts to be removed. But as it is, not so in the Netherlands (and I'm guessing it's the same in the United States). Glad to see this thread revived. There are lots of helpful threads on teh forum, but this one was really HELPFUL for me. The tilt column was terrifying to tear into for me. After reading thru this thread a year or two back I bit the bullet and tore into mine to find that the photo step by step made it really easy. Normally when one posts on a public forum it is understood that anything they post becomes public property on that forum, unless they have specified upfront about any limitations on it's use and have some sort of copyright marks or warnings attached on or in it. Jazzman's articles had and have none of these. The articles are basically out in the public eye and are free for anyone to see or use, as long as there are no restrictions posted on or in it. Some of the forums I am on even restrict any editing, after a set period of time, to prevent people from doing just what Jazzman did. One can't just come back at some later date, even years later like Jazzman did, and claim that an article was copyrighted. That ship had sailed a long time ago. Jazzman should be made to understand that he can face libel charges for what he has alleged about Cliff on this forum and in his communications with him. Maybe he should be the one sending his lawyer's contact information (if he actually has one) to Cliff, so he can be sued for libel, especially if he keeps harrasing Cliff. Jazzman had been showing his true colors even before he was banned for cause, this is just more of his true nature showing through. He should spend his time and energy pursuing more fruitful endeavors or join the hater forum and get over it.